There are lots of weddings today around here. I know these things now because we dress people for them at 30 Church Women’s Clothing across the street. It is a lovely thing to help people get ready for big important days in their lives. Who knew I ‘d like it but I do. 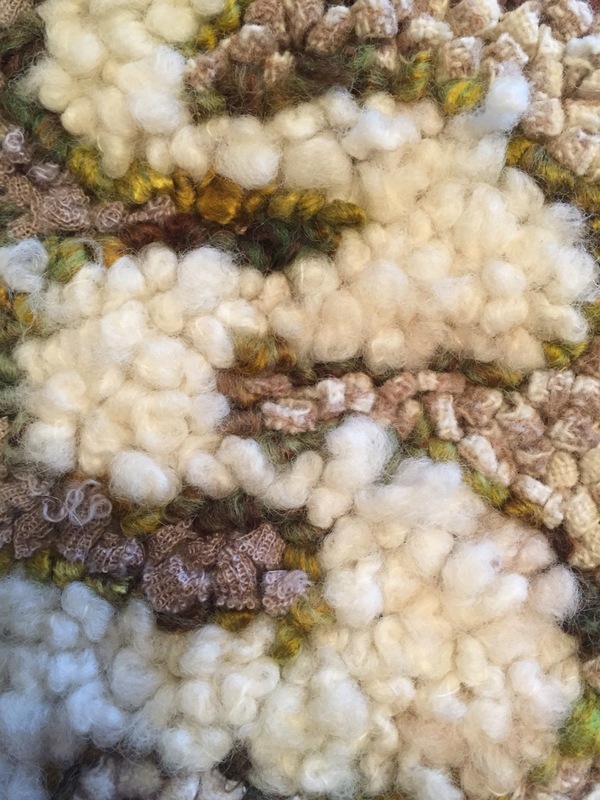 I am midway through a project of 51 small squares that combine landscape and abstract. It has been so lovely. 51 because I am 51. I take small square pictures on my walks and then hook versions of them. Sometimes I still think I am 50, When I hang them I might make myself 49 because that would be 7 by 7. 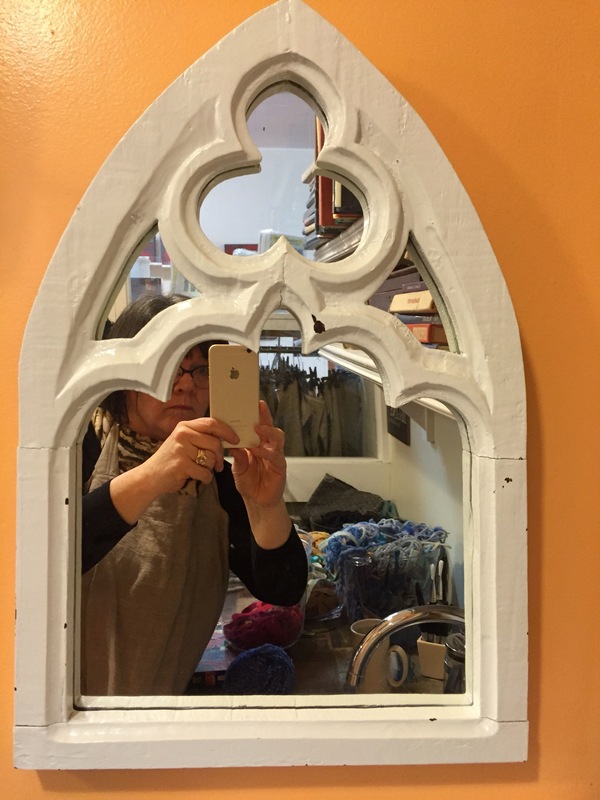 I am one of seven sisters and I like symmetry, so I’ll be 49 when I hang them if hang them 7 by 7. I think I will actually have to make 60 or so to get the right combination, but I’ll not be sixty for nine years. It is fun to talk nonsense isn’t it? A little foolishness is good for ya. 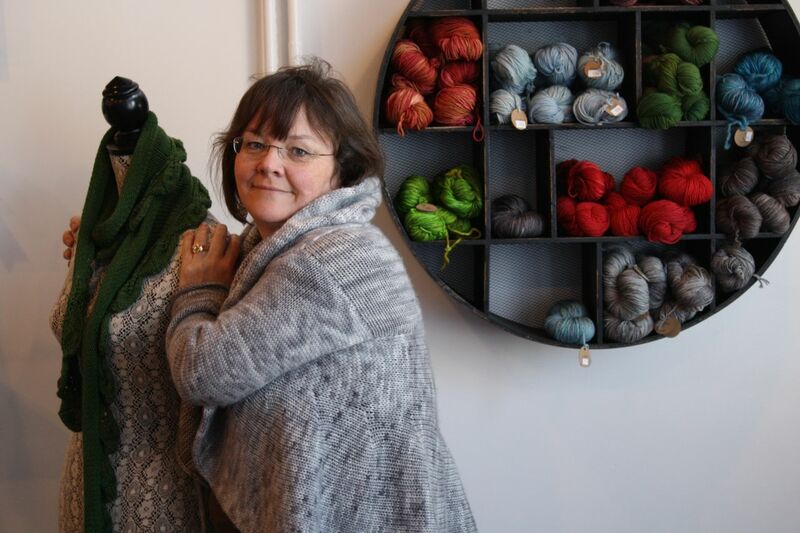 Yesterday Tanis from Tanis Fibre Arts , a beautiful knitwear designer and dyer came by the studio. 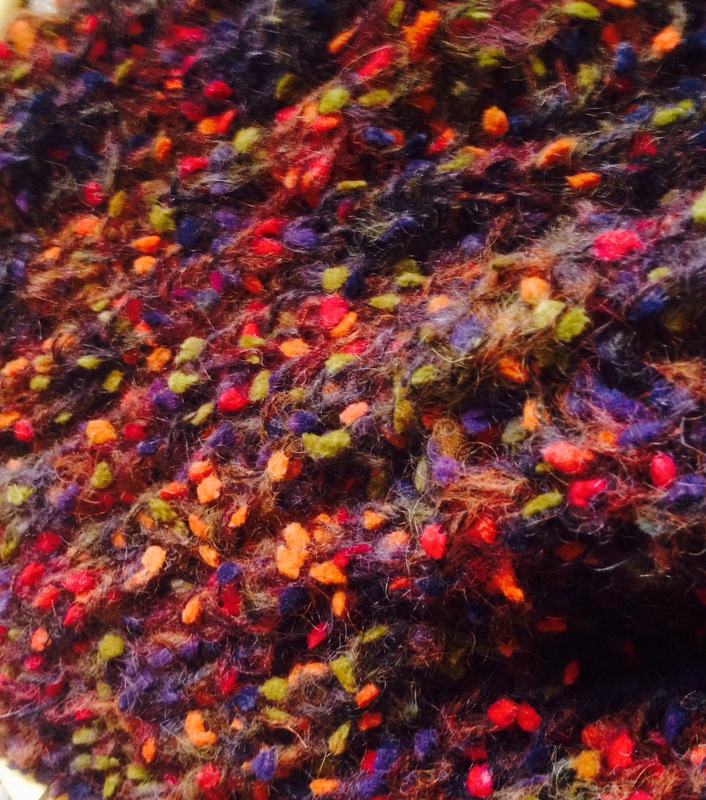 If you are a knitter you should visit her site to see some great designs and colour ways. 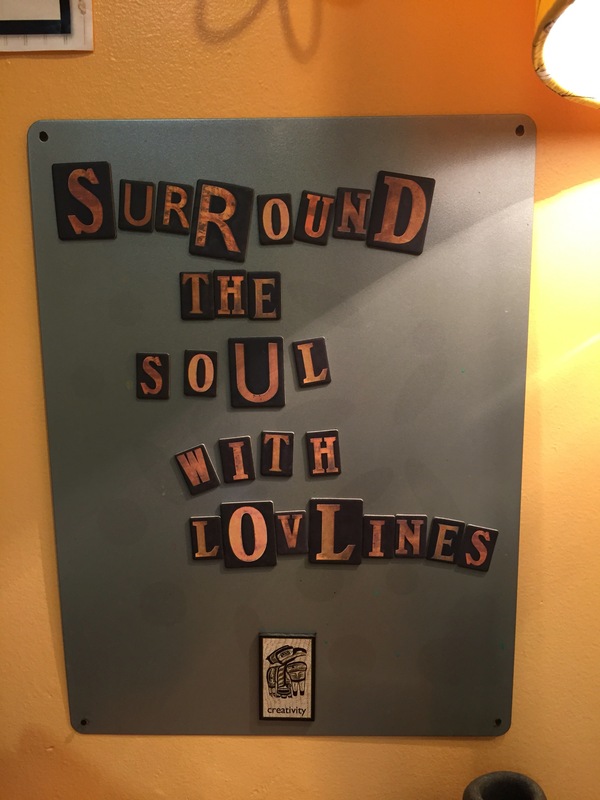 While she was there she gave me some great tips on doing My instagram is…. 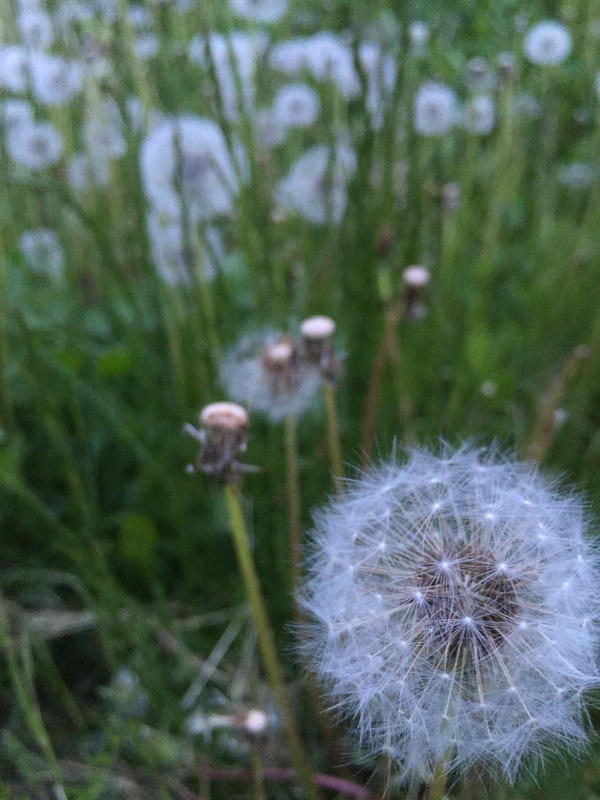 I think Instagram is a great way to get inspired. I use it like a magazine with a cup of tea, and scroll through it following people who post beautiful images. Tania also showed me how to edit my images. I thought you could just do filters but you can also highlight, lighten etc. She showed me quickly and now I am instagram happy. You can see some of the squares on my instagram. 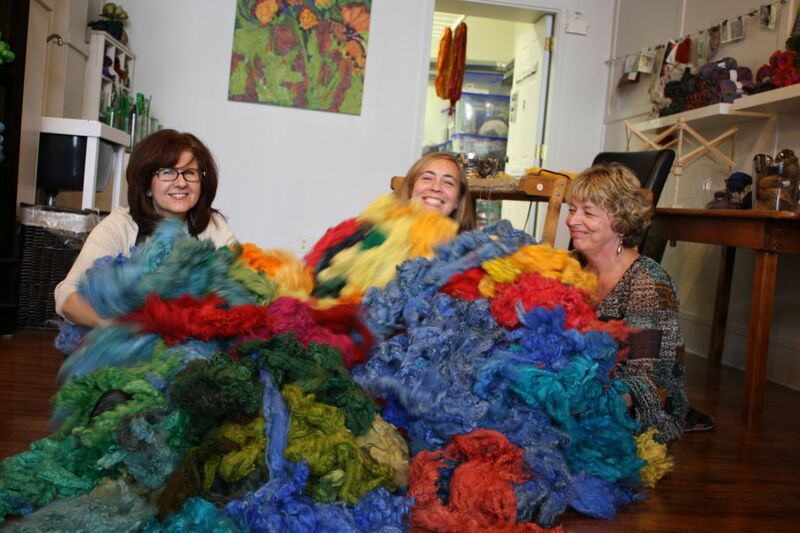 I encourage you get the ap and follow Deanne Fitzpatrick Studio and Tanis Fibre Arts. I think what I loved about Tanis visit is her willingness to teach and to share. 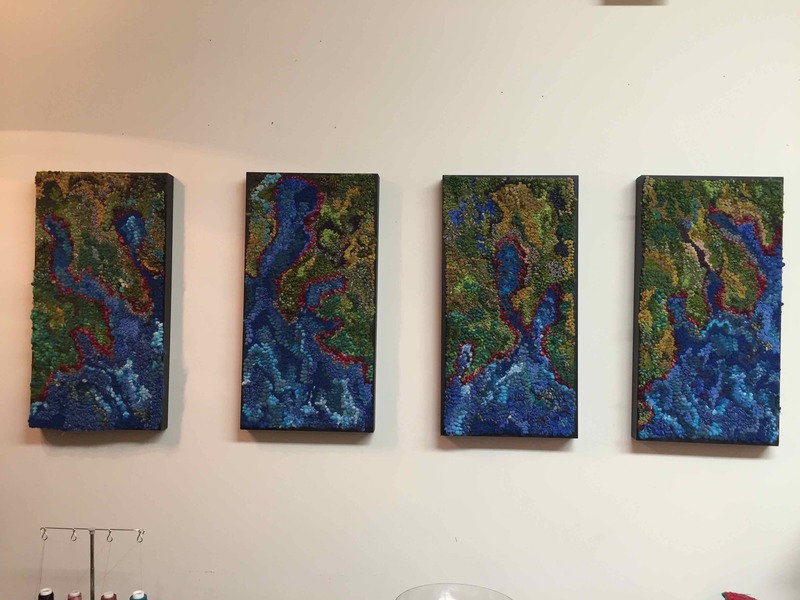 I also loved that someone who surrounds herself with colour on a daily basis was inspired by the colour we create in the studio. She really got me thinking about pallettes, about making things even more beautiful than they might already be. You see beauty has no limits, it is like love. The more we share with each other the more we become aware of our own possibilities and those of others. Summer shots below, and my rugs of the Pugwash estuary…..
For two years I worked on a knitting book with Megan Ingman’s help. I started out as one idea and over time morphed. I had made all the designs with Megan’s help, done the knitting and written the manuscript.at some point Megan decided that she could not co author it with me and we agreed that I would go ahead with it alone. So the bookstarted out as one thing and morphed into something else. I even had a publisher all lined up. Last week we were ready to the photography and I just felt that I needed to call it off. I felt as if in doing the book I was not following my spirit so I had to call a halt. Everything was good with it. Megan and I remain good friends even though she does not work here anymore and the book was ready to go. I just felt that for some reason I could not define I did not want to go ahead with it. It was one of those things that was seemingly right but something was niggling at me about it so I let it go. 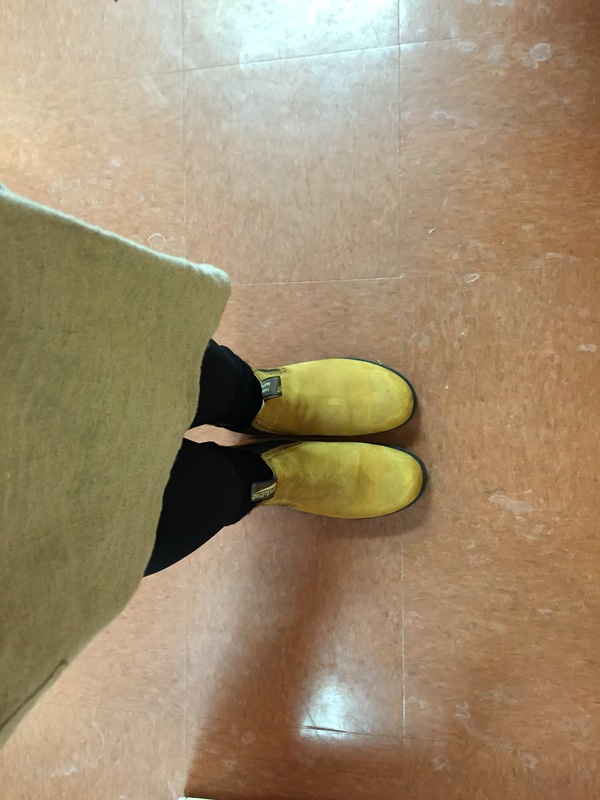 I stepped back, and in doing that I felt relieved. Sometimes there is no answer about what direction you should go in. There is no arrow, or well defined path. You just have to sift your way through. I have learned that in saying no, or sometimes in stepping back I feel as much as freedom as I do in saying yes and moving forward with something that really excites me. 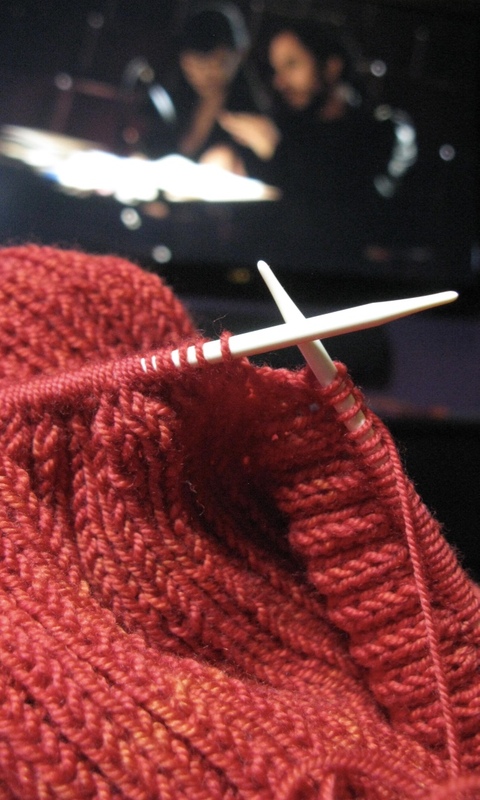 I cannot tell you why I changed my mind about doing a knitting book exactly. I can tell you however that when you say not to one thing it opens up room for more of another thing. 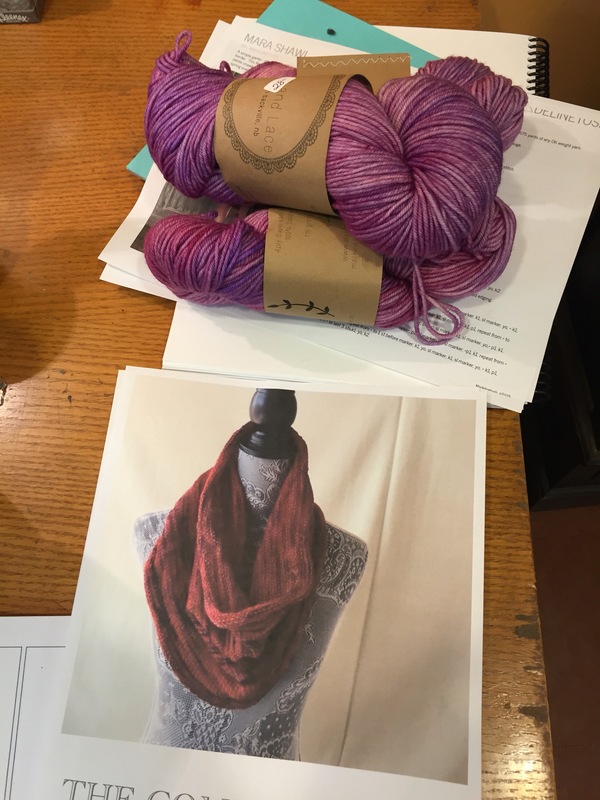 Right after I decided to move on I picked out some lichen and lace yarn and started a new knitting pattern for a shawl to match my new boots. 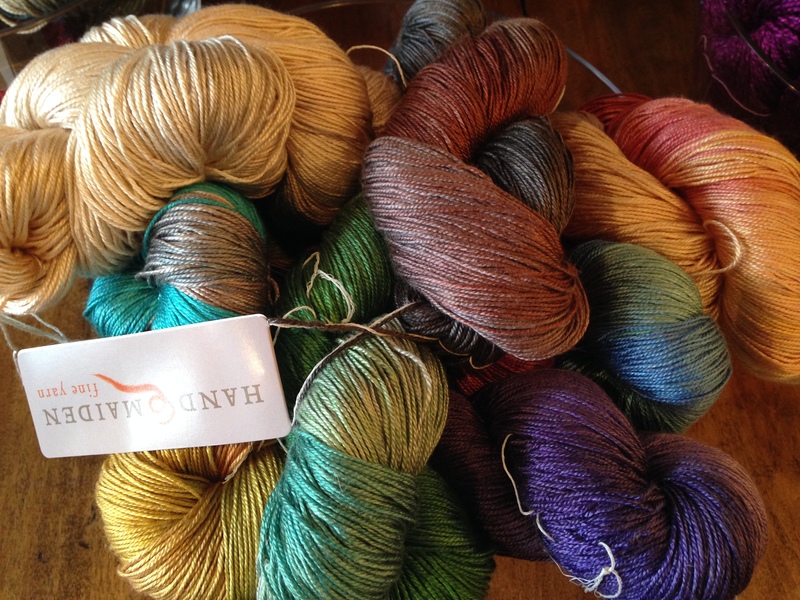 The colour is day lily, and really at night I just want to knit that shawl, and it makes me happy. Sometimes you just need to bring simplicity back into your life. 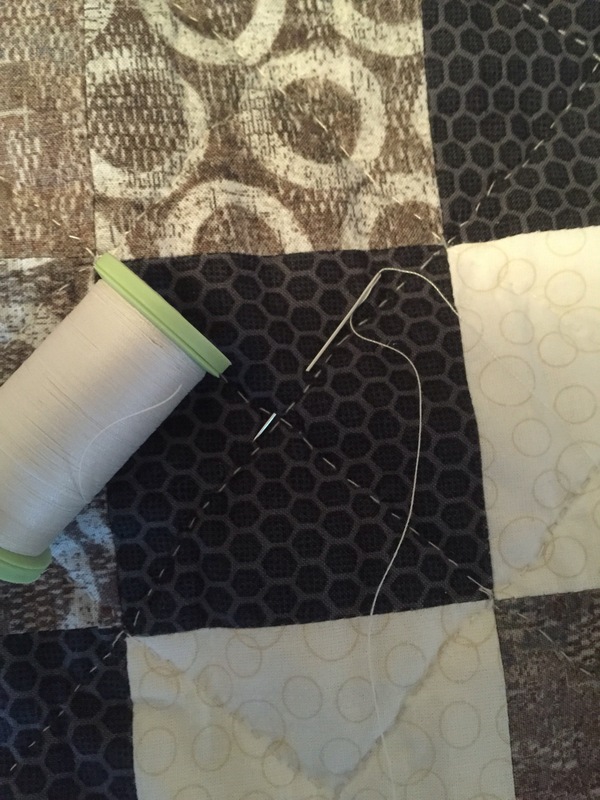 Projects can be tempered and tamed down. Dreams can still happen they just might be different than you anticipated. The forecast was ominous and so again we cruised the grocery aisles for a few necessities and some unnecessary snacks. And we waited and watched. Predictions of 50+ that were looming over us on the weather apps, were accurate. We scored with 65 cm of fresh white snow. 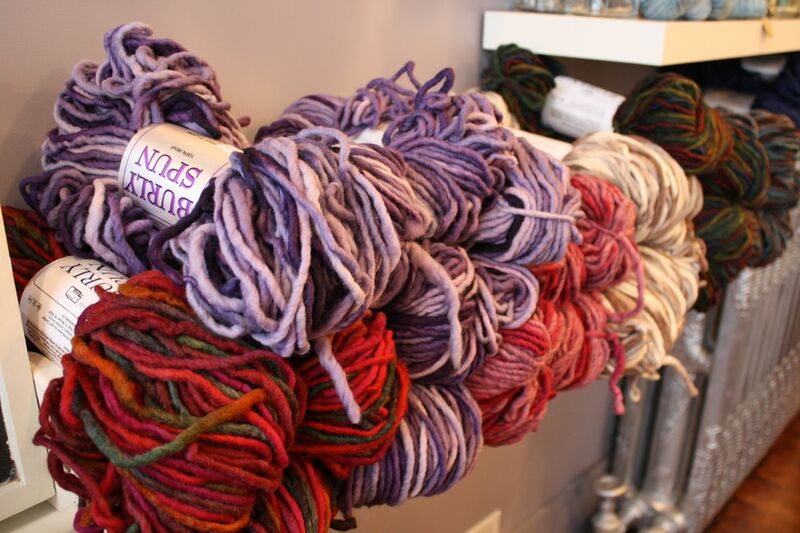 I had recently purchased some nice yarn at Deanne’s studio ‘for later’. 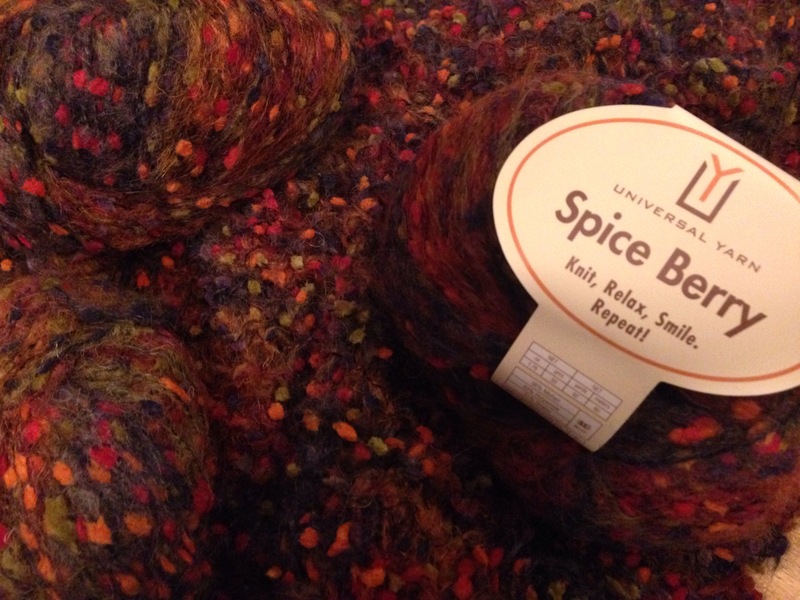 It had lots of colourful bits and a lovely name, Spiced Berry and the colour was Peppercorns. Really, what better time to pick it up than during a storm? So the later came early and as we watched the stormy action through our windows, as we watched curling and movies on TV, I knit. 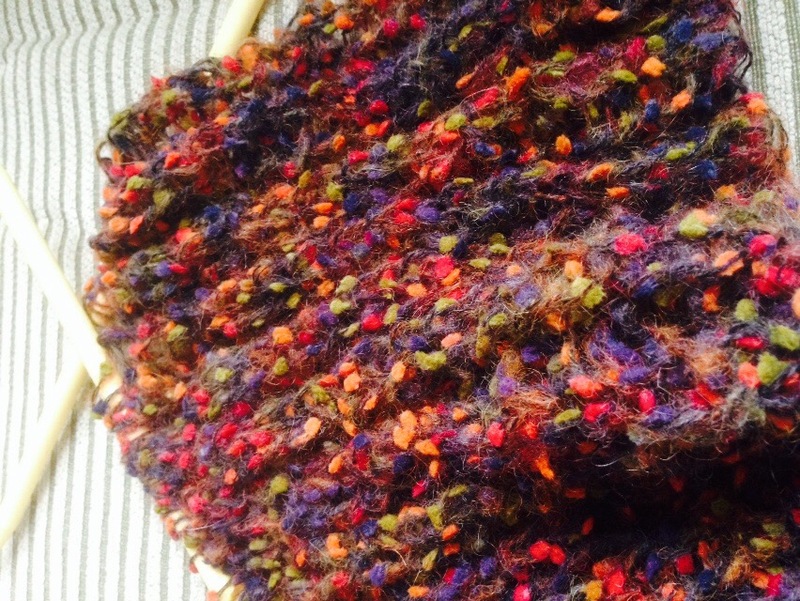 My shawl was half way finished before I had to put it down to begin the digging out process. 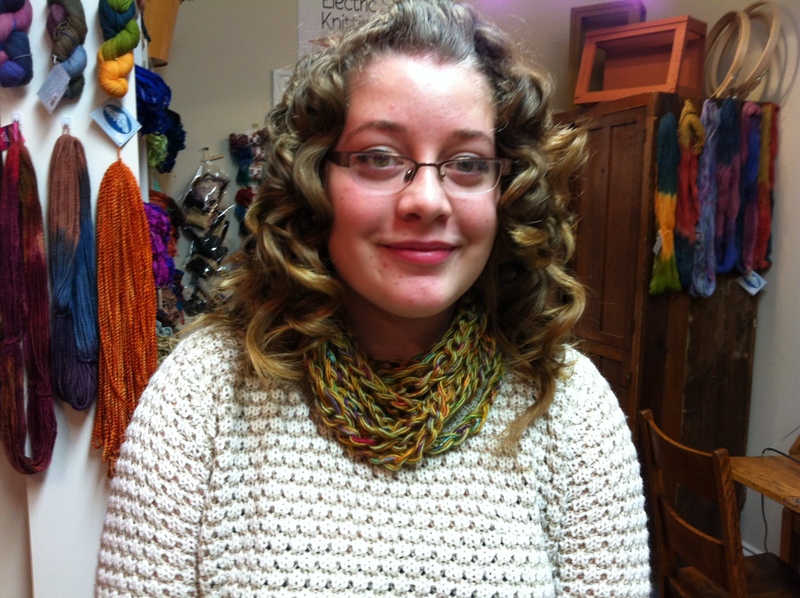 It’s colourful, light and loose and will be perfect to throw over my shoulders in the spring, after all this snow melts! 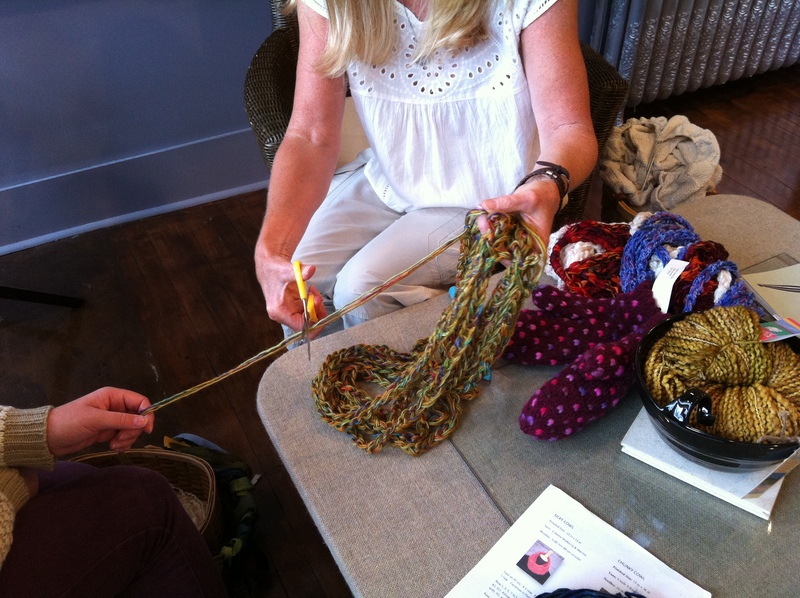 Looking for a great knitting project for the summer ? 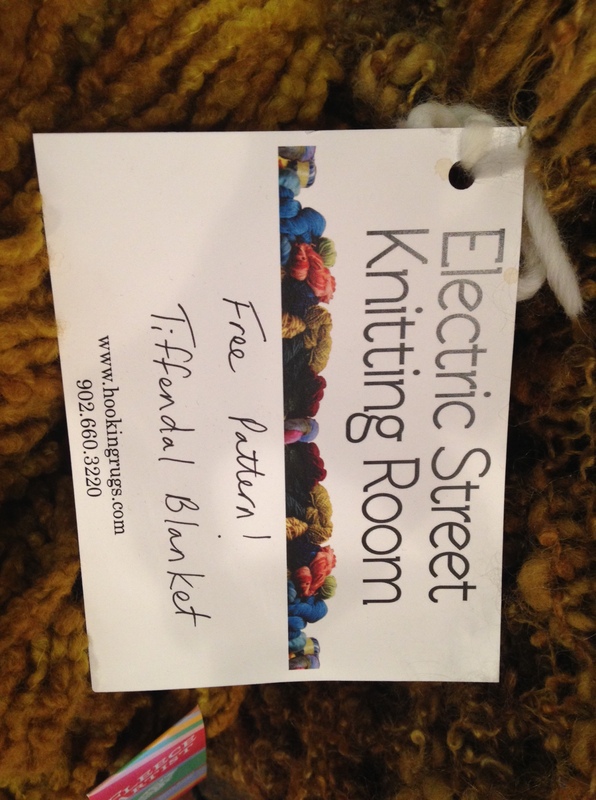 This beautiful Tiffendell blanket is so soft and cozy, great for sitting around on those cool summer nights. 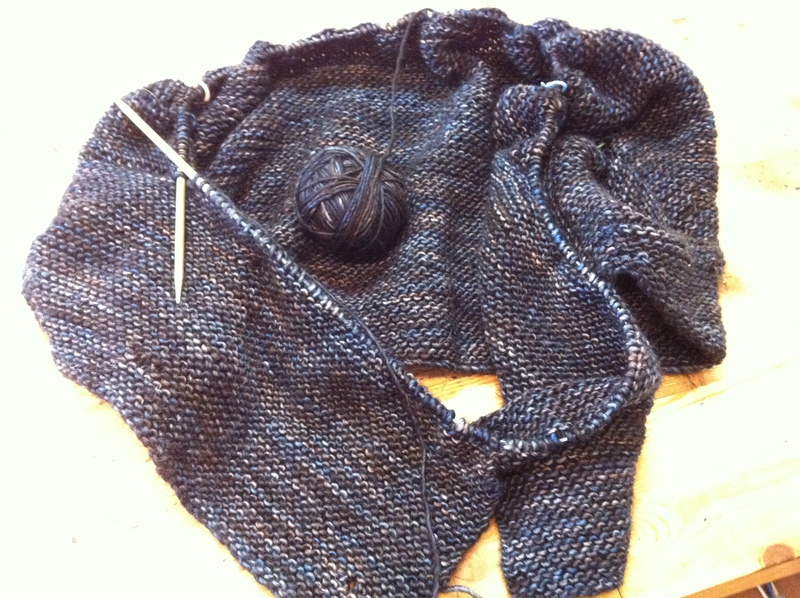 Beverly Mulcahey has hooked a lot of my patterns. She has been visiting my studio since my kids were little. They remember she sent them those oversized sunglasses when they were little. She hooks. She knits. 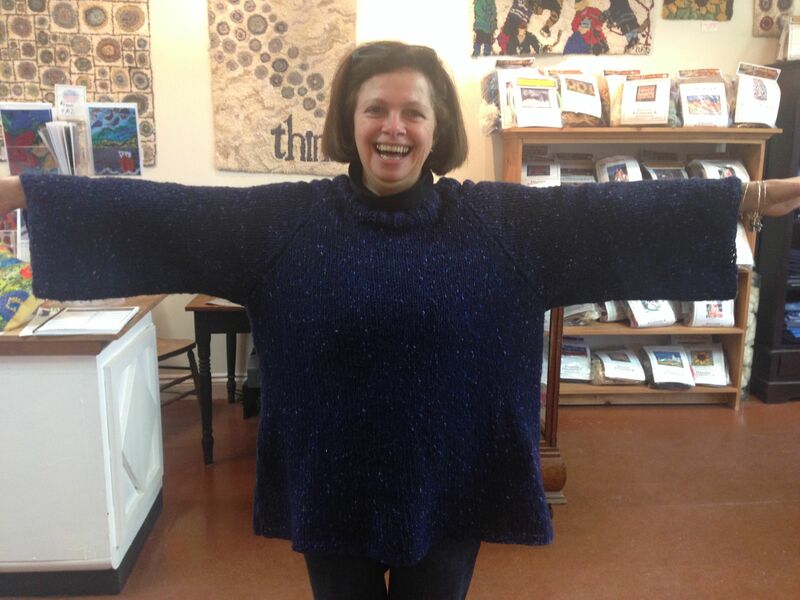 See her sweater she has on…she knit that. She knits to relax so it’s easy she says. She is joyful and fun. She teaches nearly forty students in her hometown of Paxton, Mass. I see her every year and every year she has a story or three or four. She is always excited to come here. She is a good friend of the place so she understood when we started moving furniture while she was here. She knows what we are like. 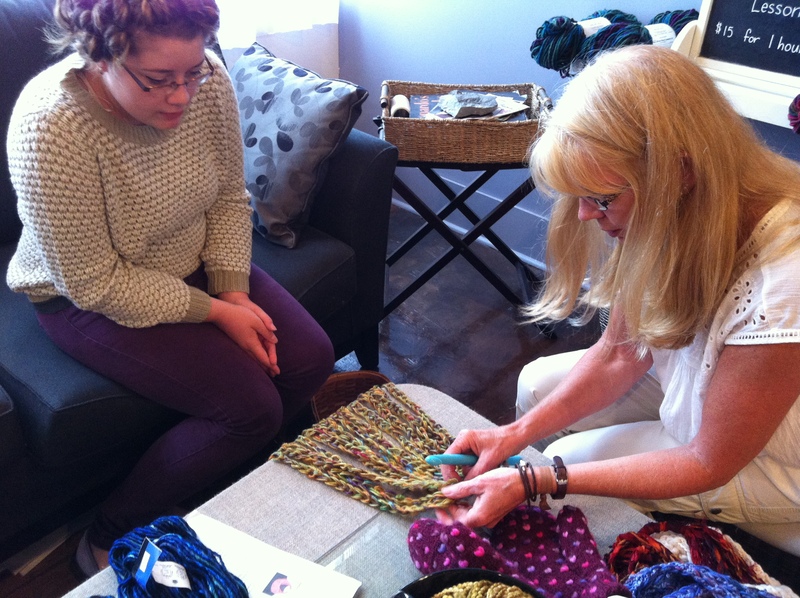 She is Beverly… and we are glad she comes and teaches and inspires others. 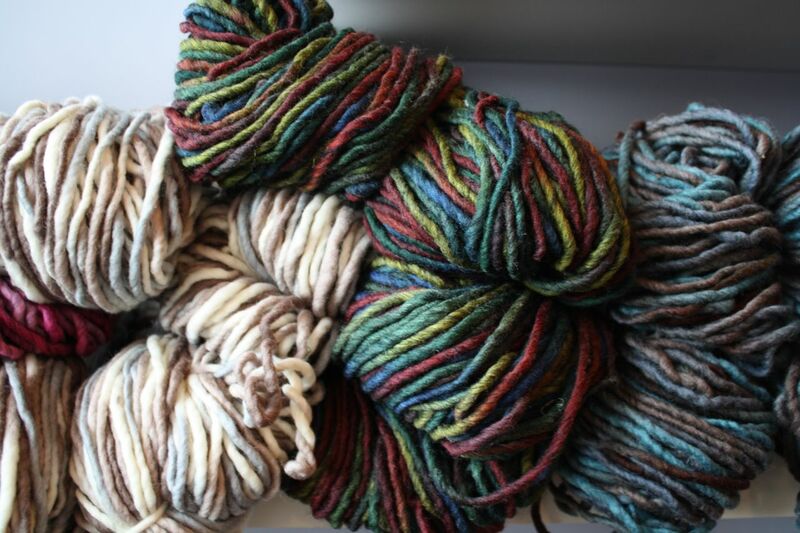 My friend asks me what I’ve been doing lately and I reply, “Oh, just knitting.” I call another friend, ask the same question and I get, “Just knitting.” I text my daughter, “What are you up to?” And again the same reply. She went to her friend’s house and you guessed it, she was knitting! 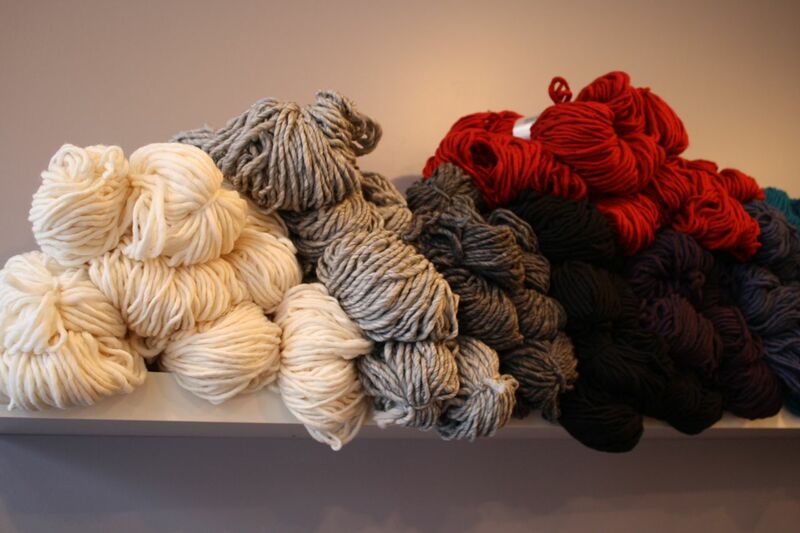 Everyone is knitting, enjoying the simple rhythm of the needles, moving wool forward, looping it around, knit one, purl one, knit two, purl two. 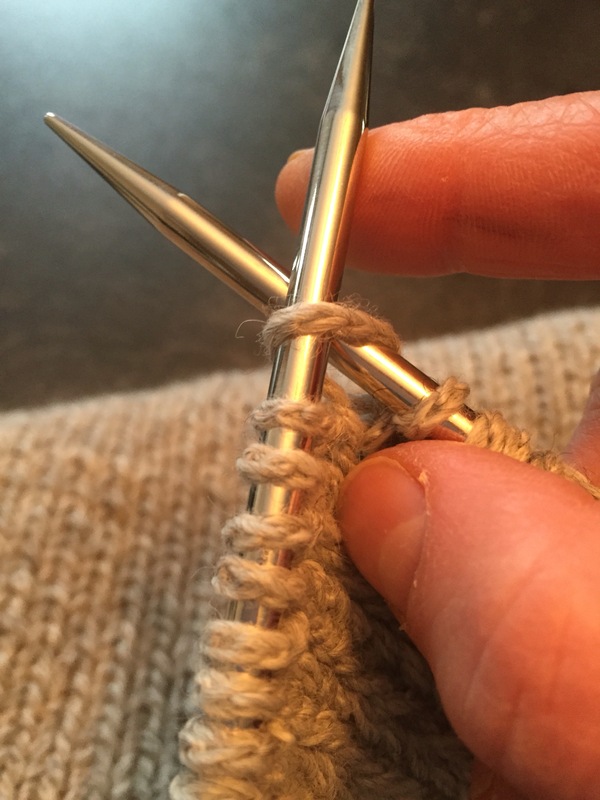 Using circular needles, made of plastic, made of metal, straight needles passed on from elderly family members who are no longer able to knit. 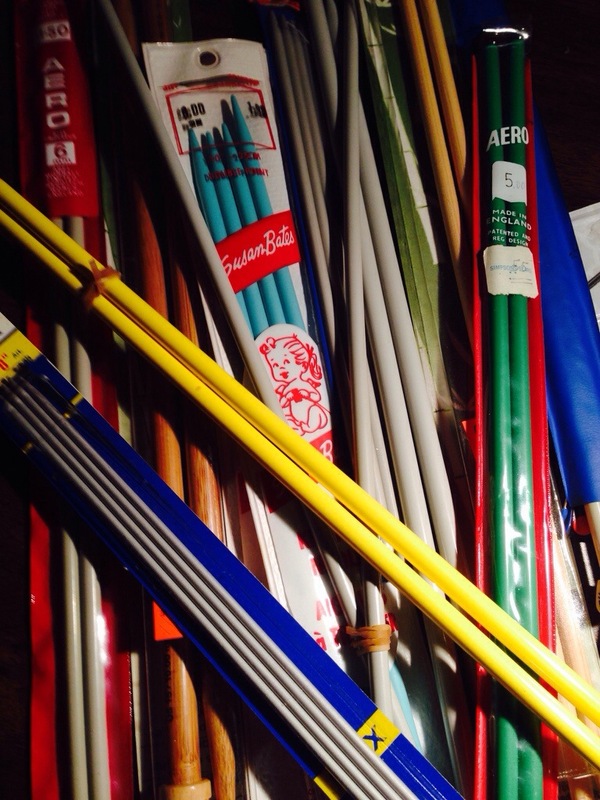 Bamboo, plastic, metal, needles that ‘click click’, we create a beat as we knit along. 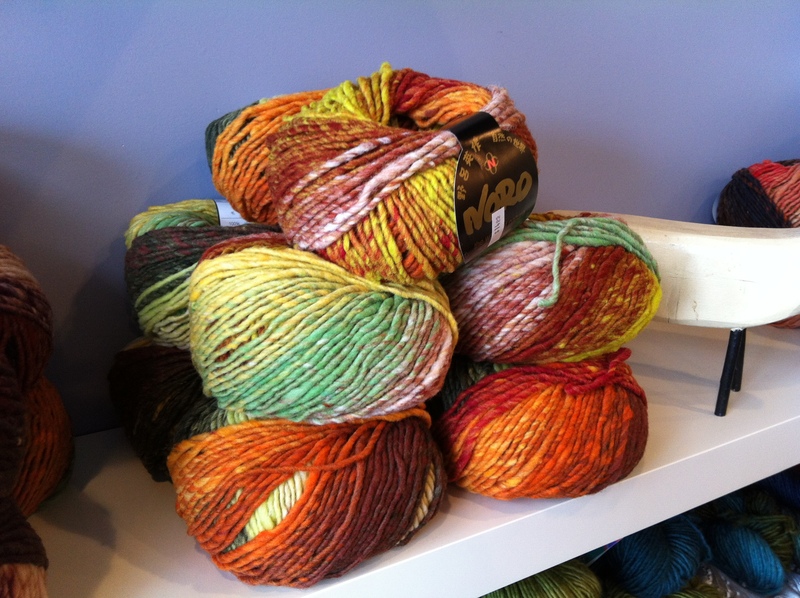 Here at the studio, many people leave with lovely skeins of colourful yarn, excited to get home to knit. 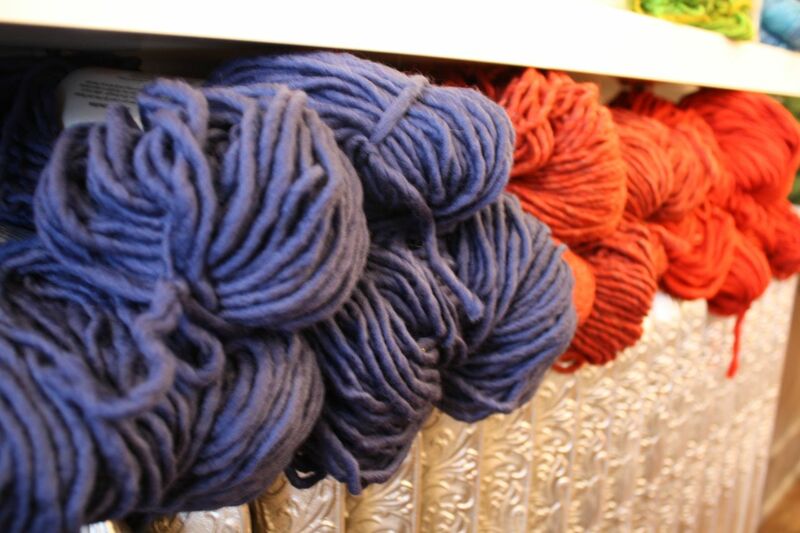 Some buy the yarn with no definite project in mind, letting the wool inspire them. 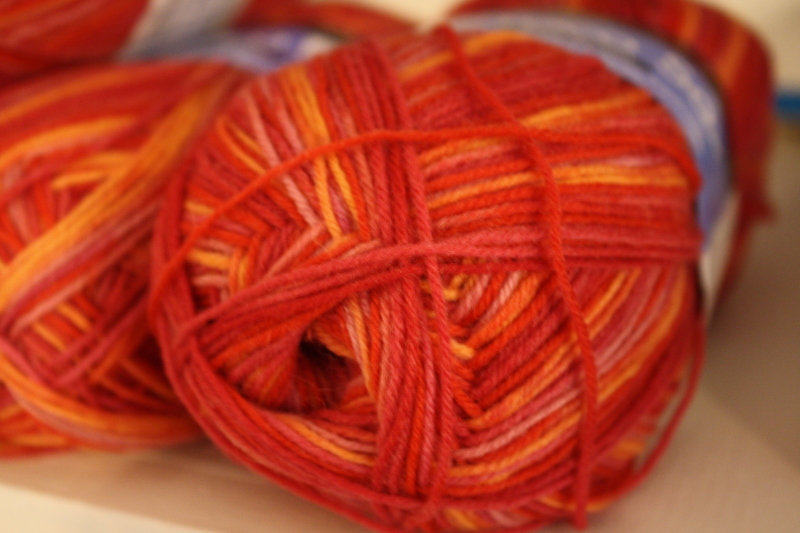 The Olympics are about to commence, so what better excuse does one require to sit, watch, cheer, and of course, knit? 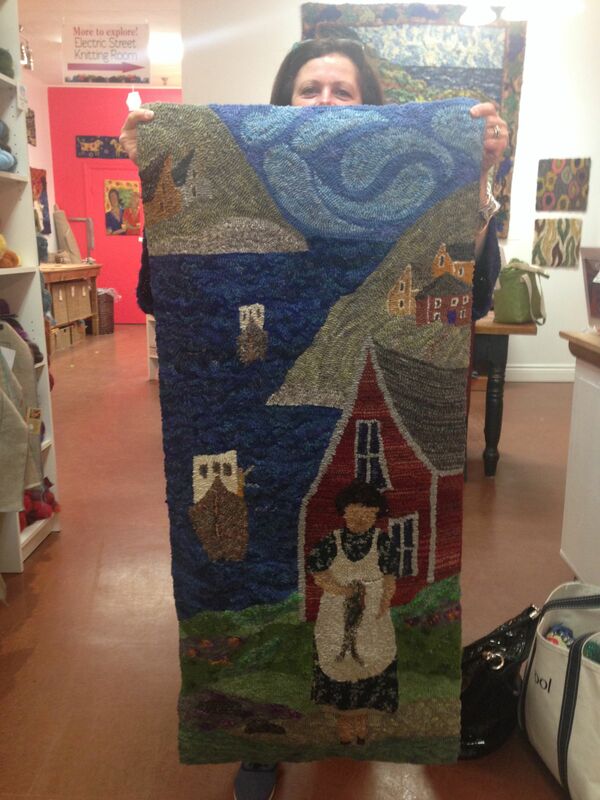 Last May Deanne had just finished up a 3 day workshop when she decided to do some free drawing on some left over burlap. 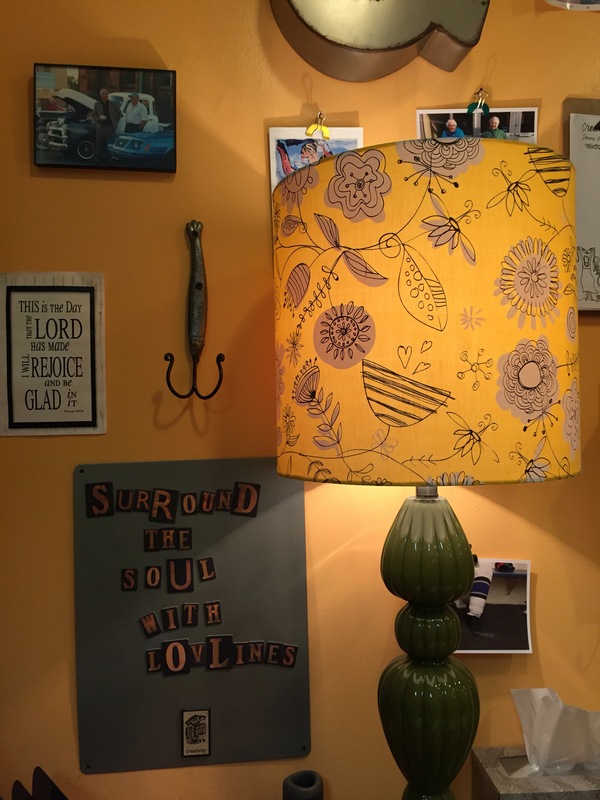 As soon as I saw this sunflower design I knew I had the perfect spot for it in my kitchen. 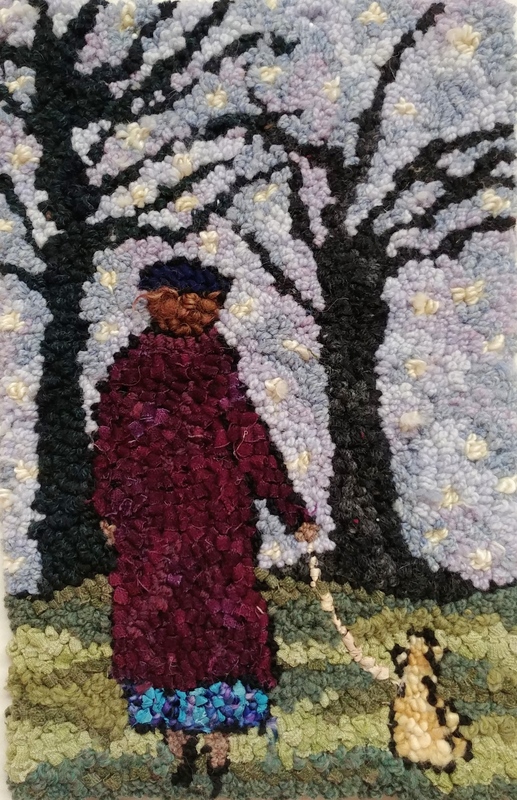 So I decided to try my first rug hooking project and I promised a lady who was here taking the course that I would finish it and show her. Well here it is January and I am still only 3/4 done. 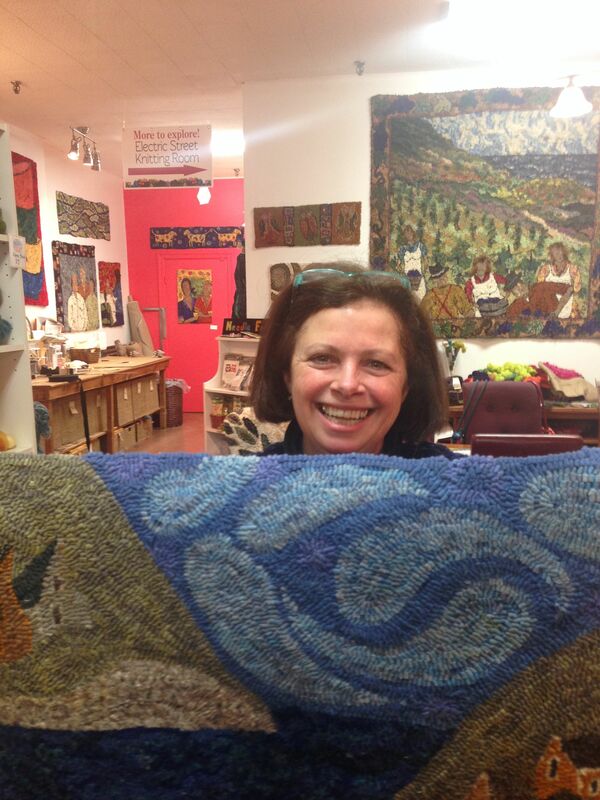 So Sandra, a promise is a promise and I will finish my rug this week and have it on here to show you. And with a little luck maybe I can finish my first knitting project as well, fingerless mittens. 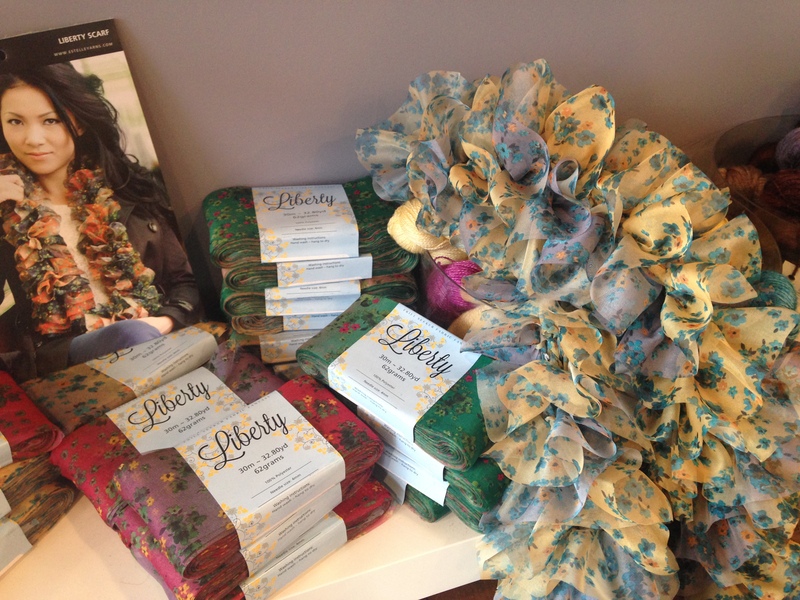 One package makes a scarf and comes with a free pattern. 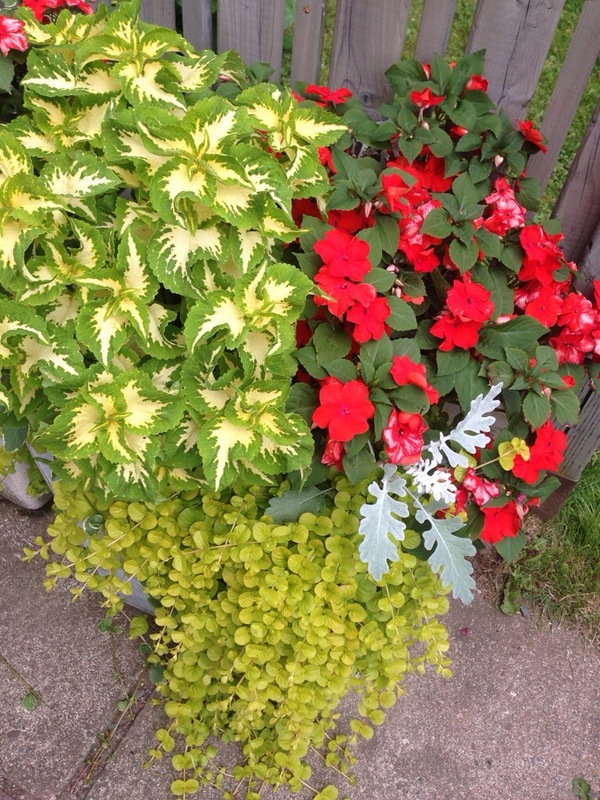 Beautiful and soft hot pinks, greens and yellow. I really enjoy a good children’s book, one with a pattern that encourages little ones to join in. Recently the story ‘Red is Best’ by Kathy Stinson has been coming to mind. 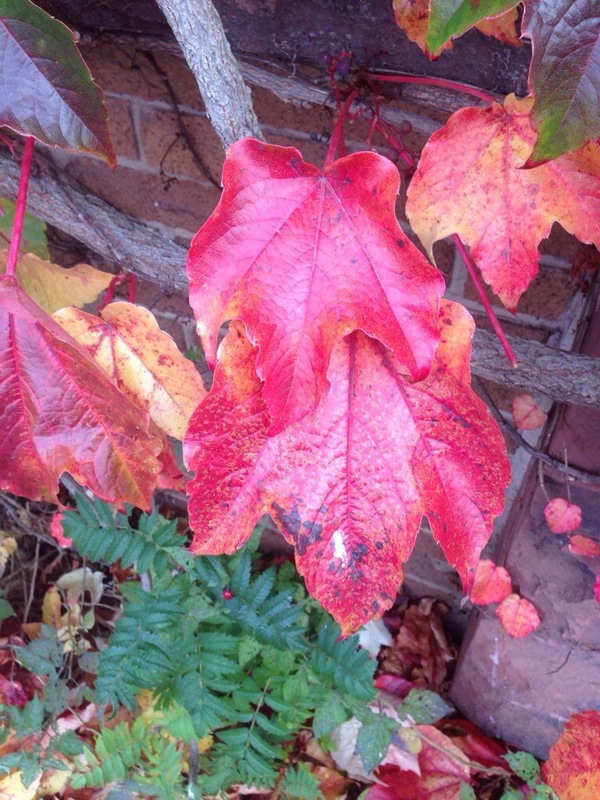 When I’m out and about and a pop of red comes up in the distance, I love how the eye is drawn to it. 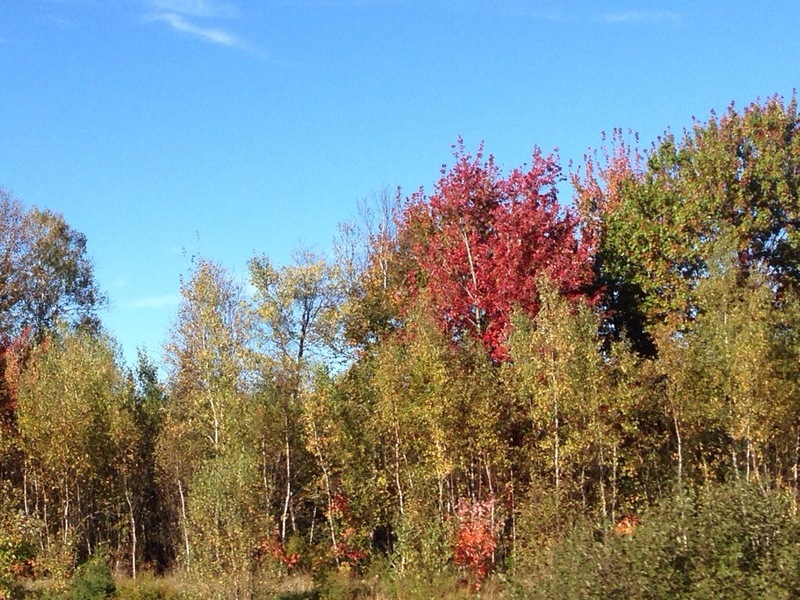 When driving by changing foliage, the red trees stand out, as do red roofs, red flowers, red doors and I do love a red barn. In winter, crimson berries against a snowy branch is outstanding. 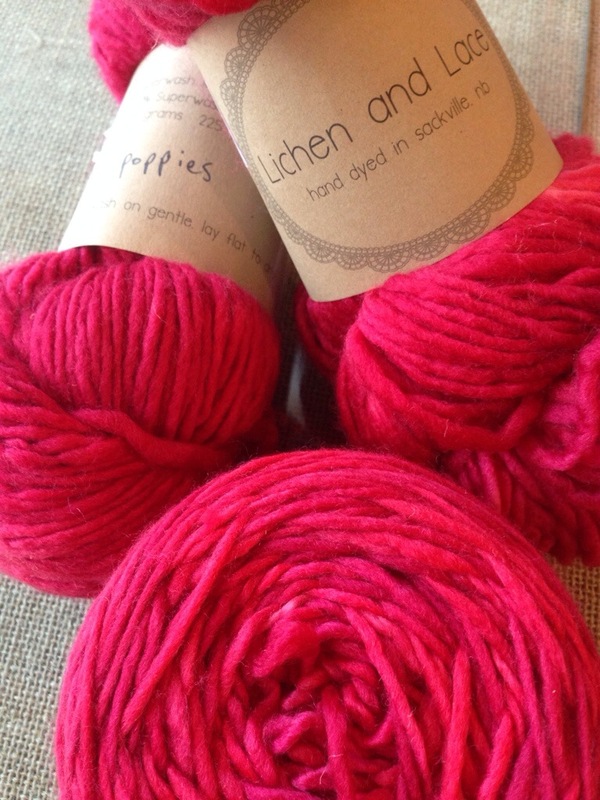 Recently I couldn’t resist the beautiful soft poppy red wool that was dyed by Megan here at the studio. Now when I wear my new scarf, I’m enjoying being part of that pop of red. 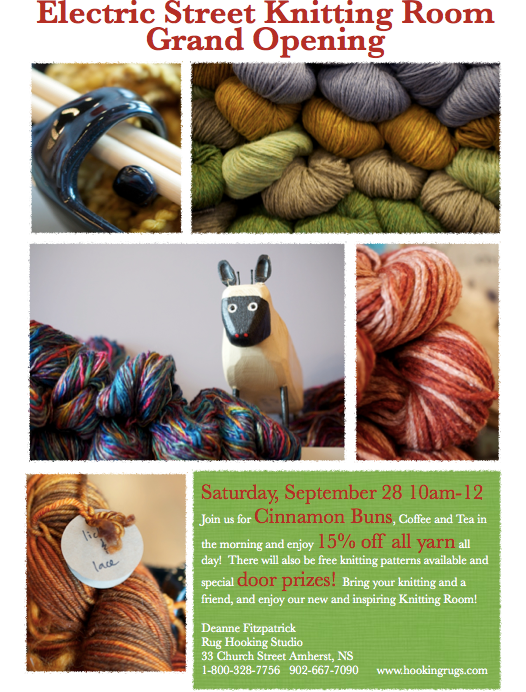 Our Grand opening is today for the knitting studio. 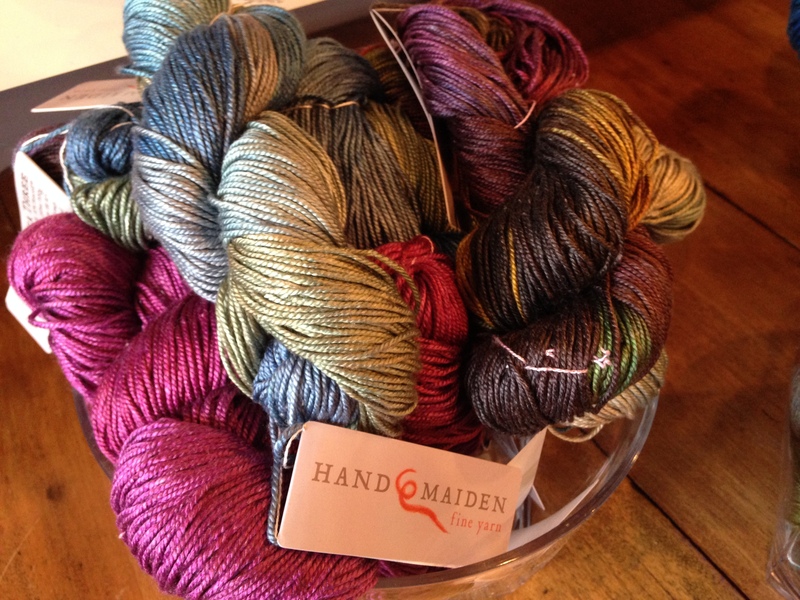 We have 15 % off all yarns for in store customers and great door prizes. 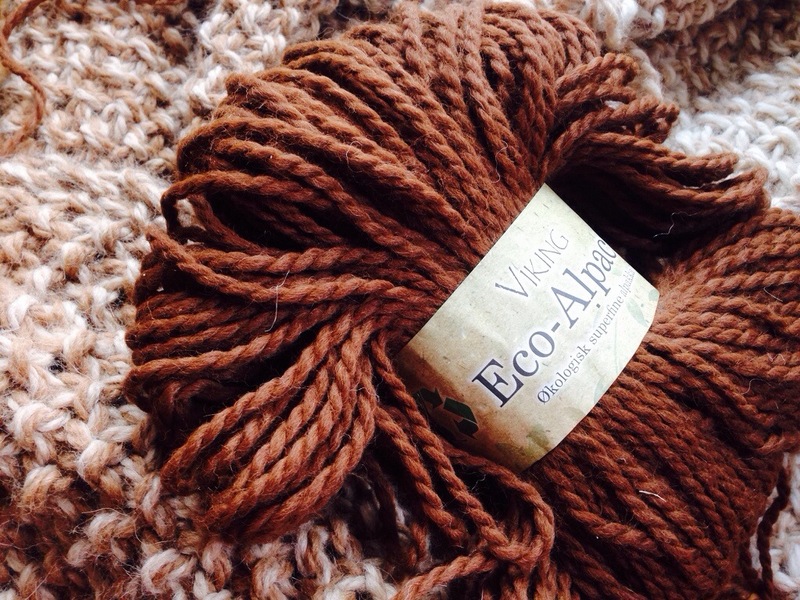 For our online customers we have 10 % off all yarns, just use the coupon code KNIT on your order form. 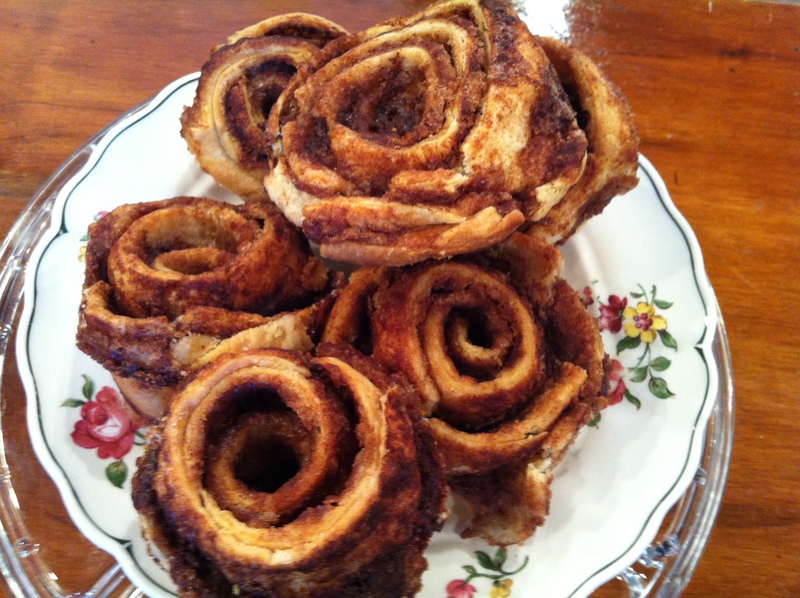 So stop in and enjoy one of Janey’s delicious Cinnamon buns. 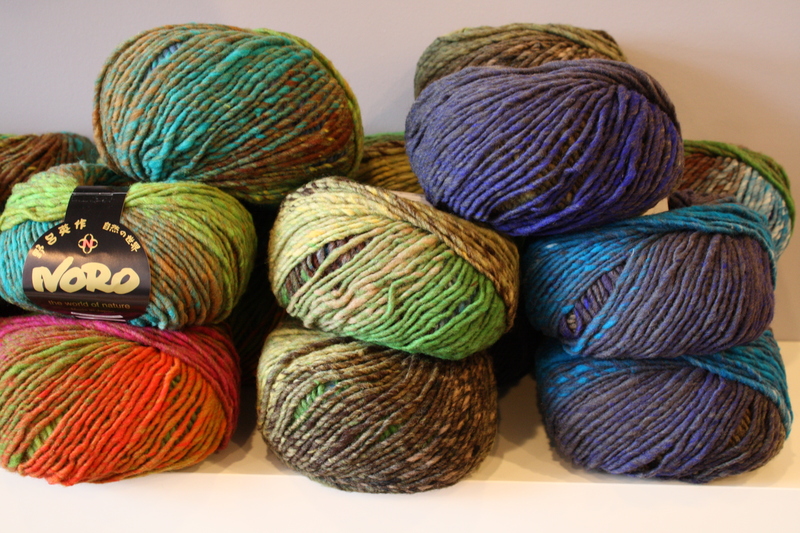 Just arrived this week are these beautiful Noro Hitsuji yarns. 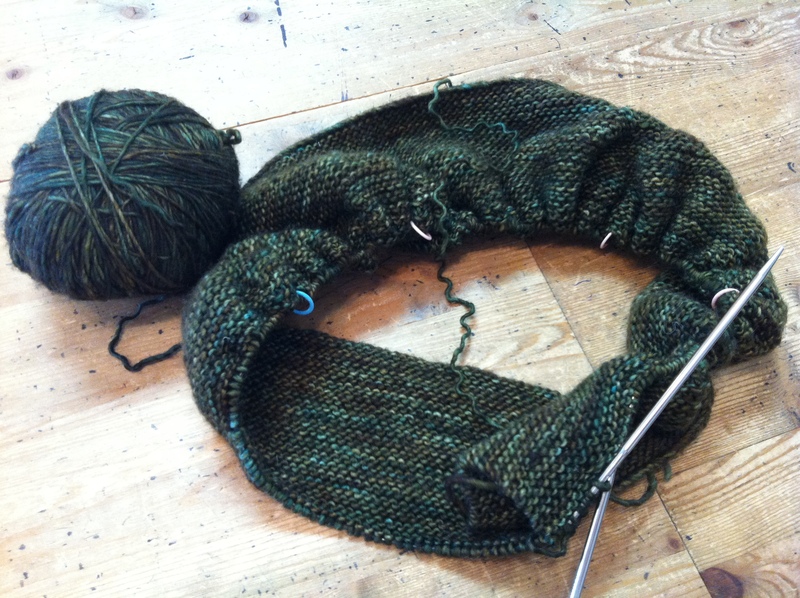 Oh yes some of you have wondered if I have left hooking for knitting….not a chance. 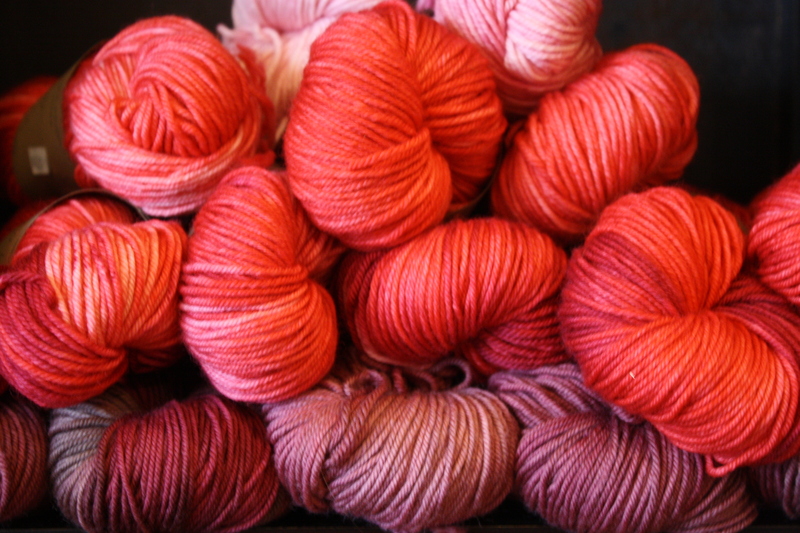 Instead I am turning knitters into hookers and hookers into knitters. 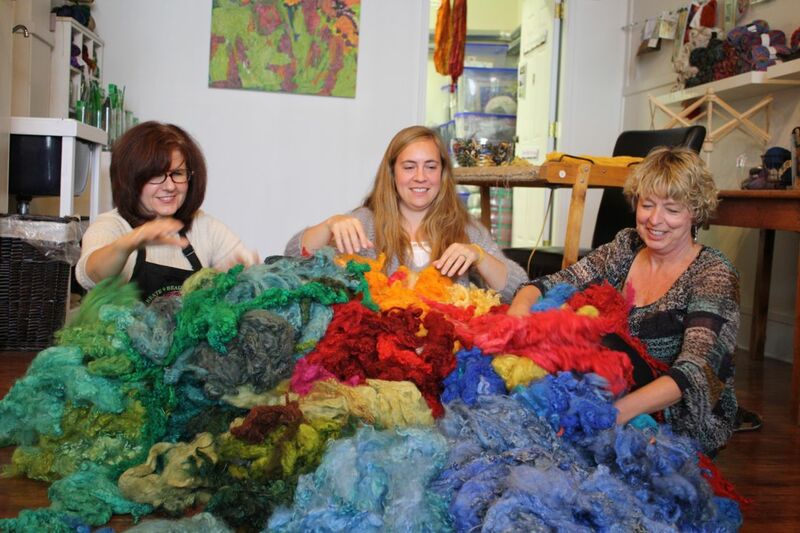 It is our mission at the studio to keep everyones’s hands busy all the time. We have found that most of you do both. 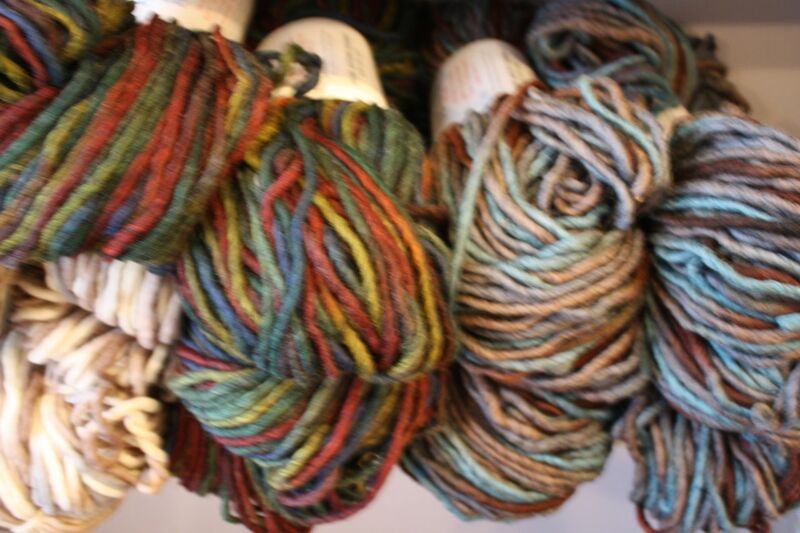 We have also found that yarns for knitting are good for hooking, and yarns for hooking are good for knitting. We are having a party to celebrate on Saturday and we are having the World’s Best Cinnamon Buns made by Janie Allen of Oatcake Fame. We’ll have a few oatcakes too, how can we not. 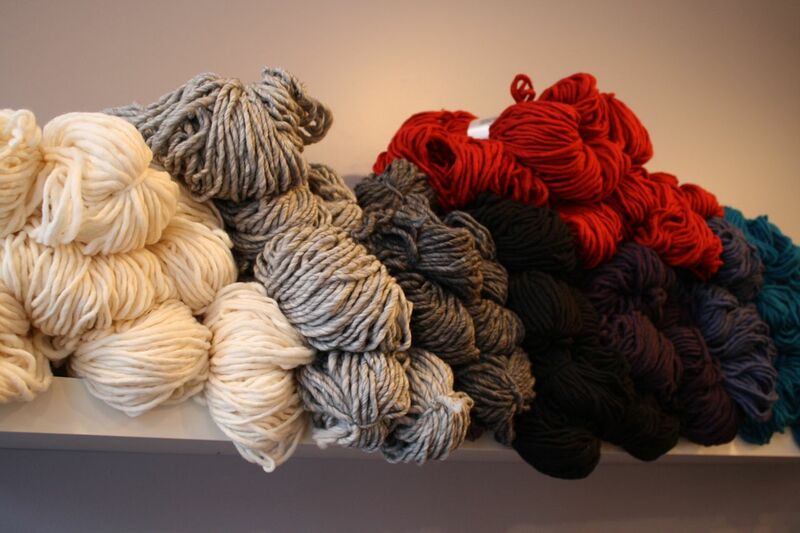 We’ll also have 15% off all yarns on Saturday including our exclusive Lichen and Lace, hand dyed by Megan, and our Burly Spun, which is one of the best yarns for hooking rugs, or knitting up a quick cowl. 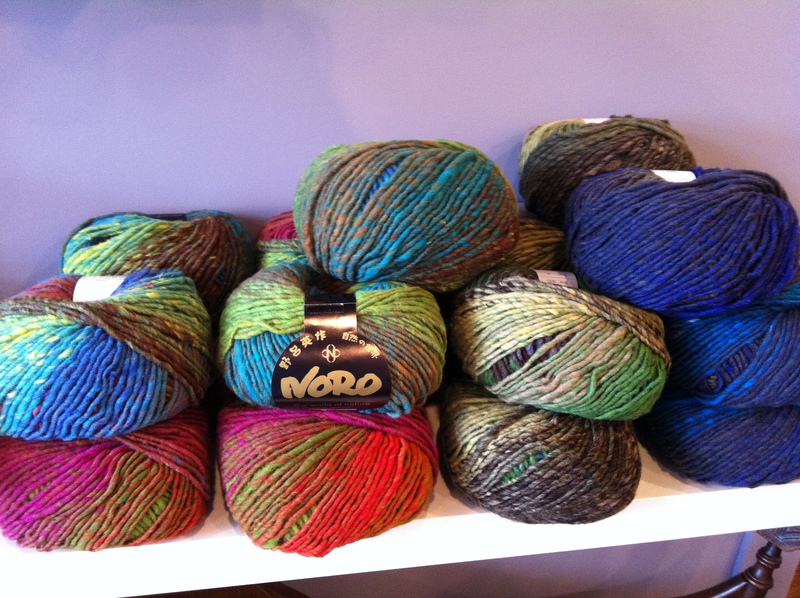 We just also received new shipments of Noro and Lichen and Lace. 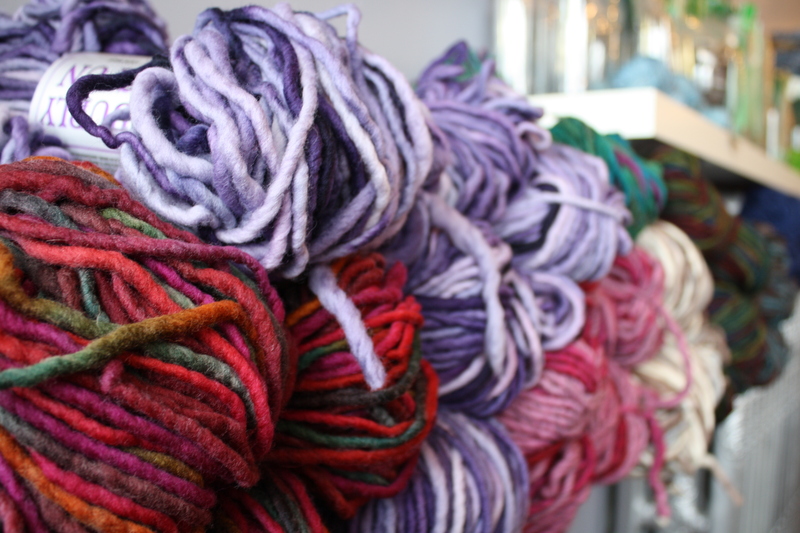 It is all so lovely, whether you hook or knit it is waiting to be running through your fingers. 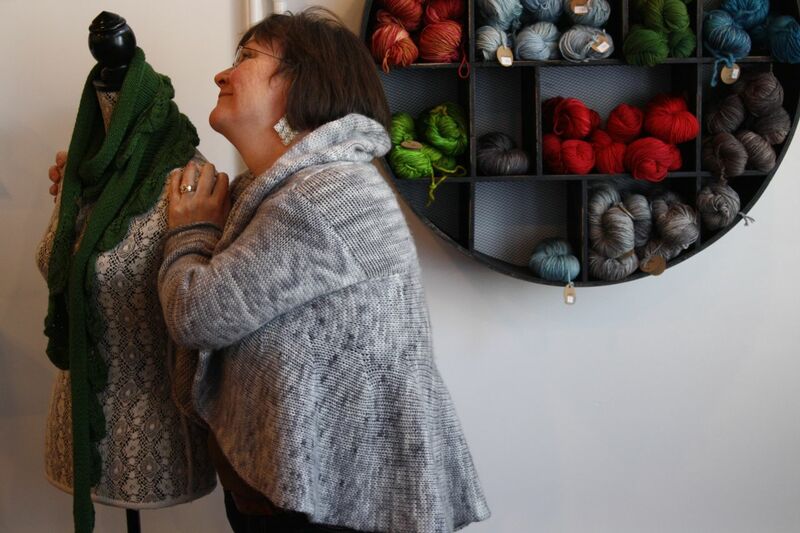 Megan and Brenda will be there to answer any knitting puzzles. 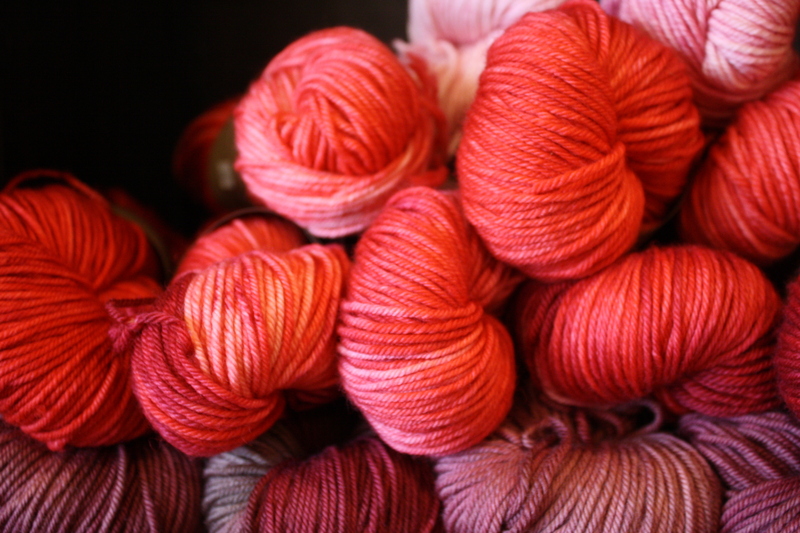 I’ll be there to pour,my dear, cause I can only knit and hardly purl, but I am passionate about my knitting already. My hooking is going along pretty sweet too. 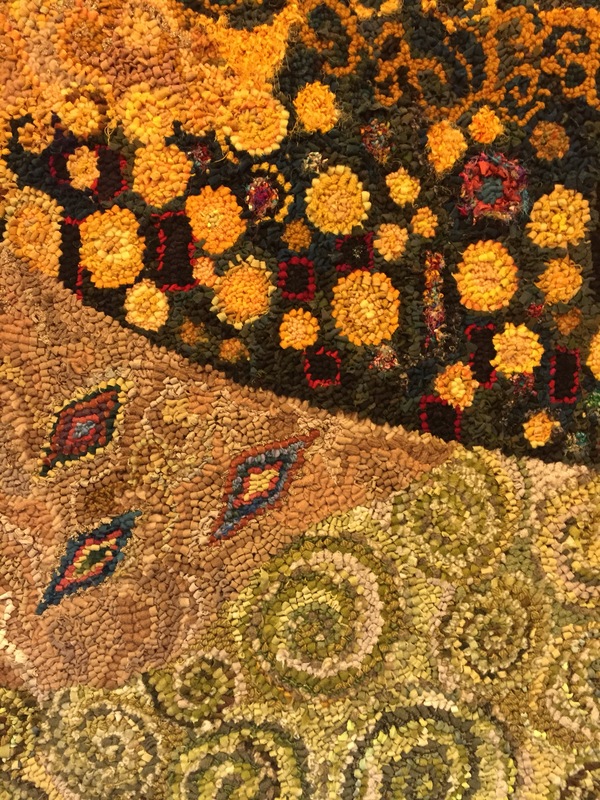 I have about twelve to fifteen rugs you have never laid eyes on hidden away for my new book. It is a fine time at the studio. 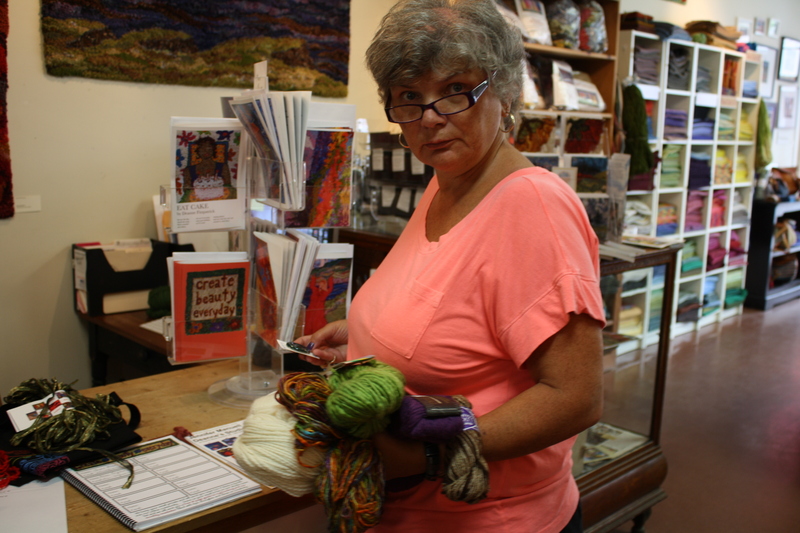 Vivian came today as she had knit a sample sweater for us that we could use in the studio. 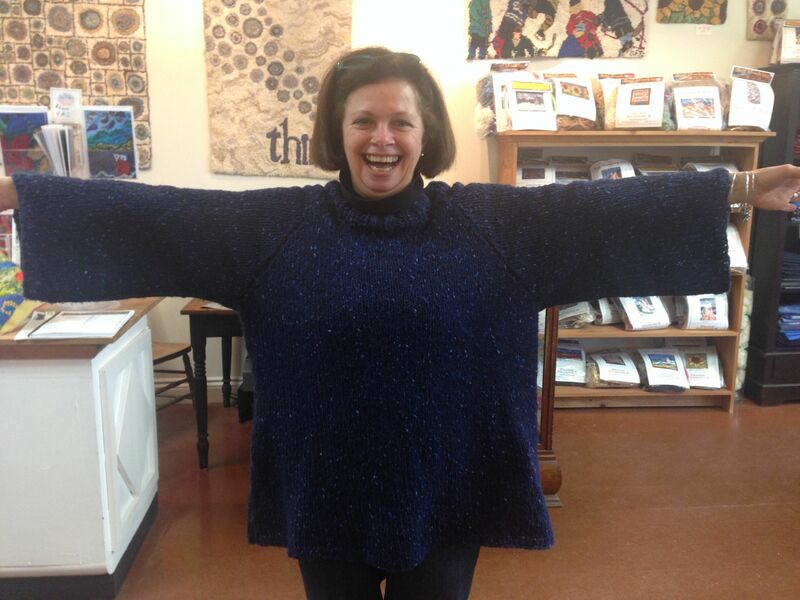 Today she brought us an incredible sweater. There is a little problem though. It fits me perfectly. 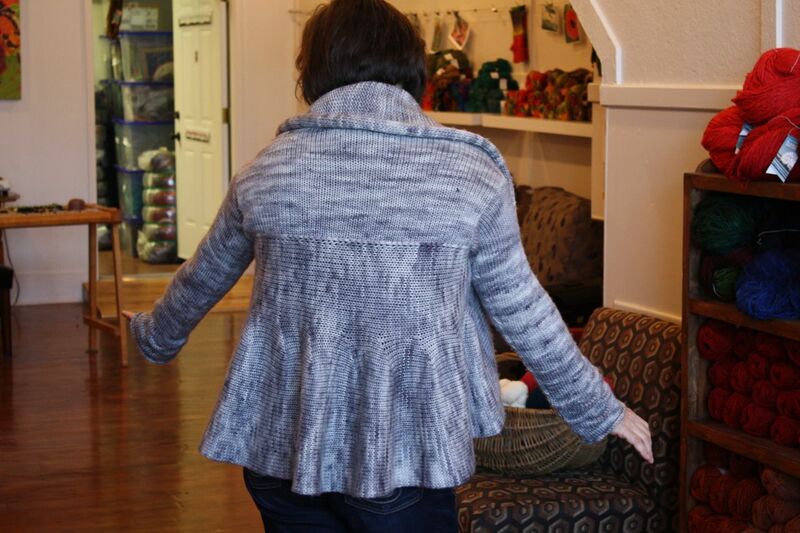 Judy, our model, likes it to. In fact Judy needs it more than me, because Judy works here in the studio night and day. 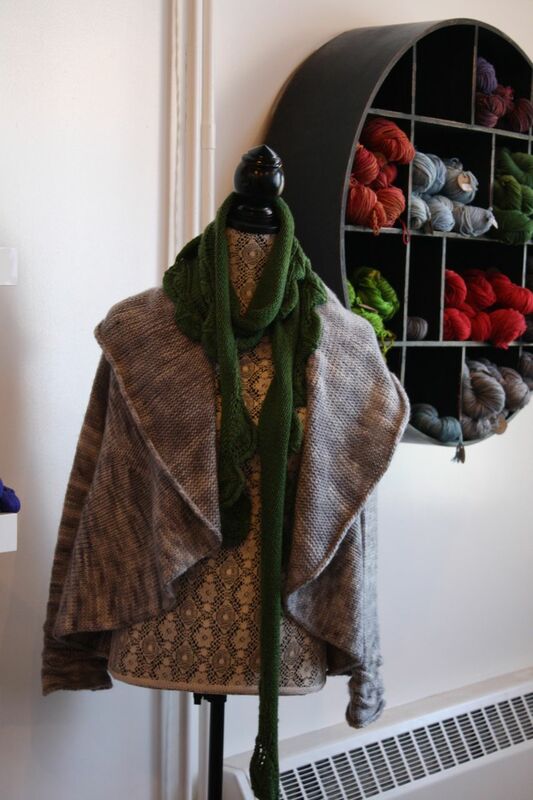 She just stands there and looks lovely in her new grey sweater and her cedar leaf shawl. But I thought to myself, Judy should share. I took the sweater right off her back, tried it on. It fit me perfectly. Vivian made that sweater for me I think, and actually, I am lending it to Judy. I like Judy a lot. She is quiet and pretty, unassuming, but as long as we keep the heat on here, she is not going to need that sweater. I on the other hand will be braving the cold. Judy and I will work it out. We’ll have to share. Thank You Vivian for your handwork. It is beautiful. Last week Catherine was here for the afternoon doing some photography for the studio and her daughter Charlotte came along for a visit. She was going to write her driver’s license later that day so she had her hair all pined up so it would be curly for her picture. I remember my Mother doing this with me only she used brown paper bags to tie the hair up. I had to laugh that she was trying to get her hair to have curls and I was trying to get mine straight. 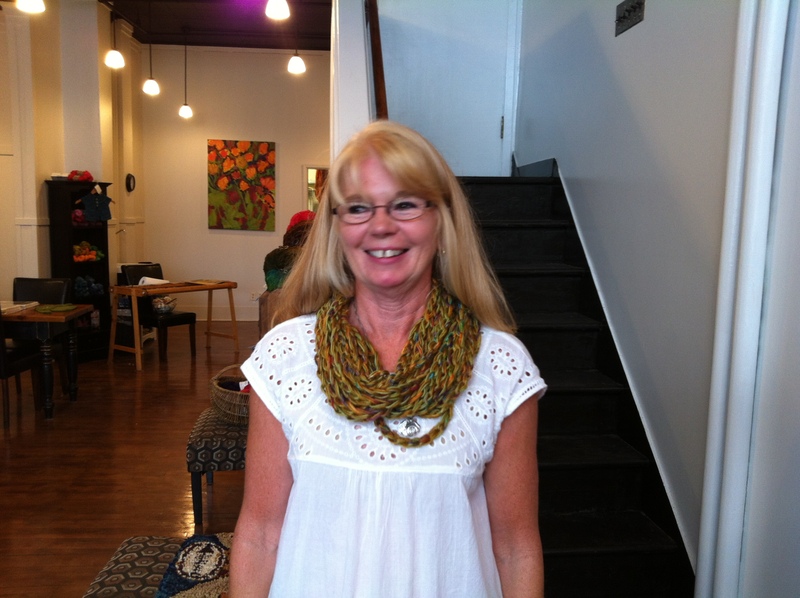 Charlotte is crafty but has never tried crocheting before until Brenda was showing us this cute scarf she had made the day before. Well it wasn’t long before Brenda had Charlotte all set up and crocheting. 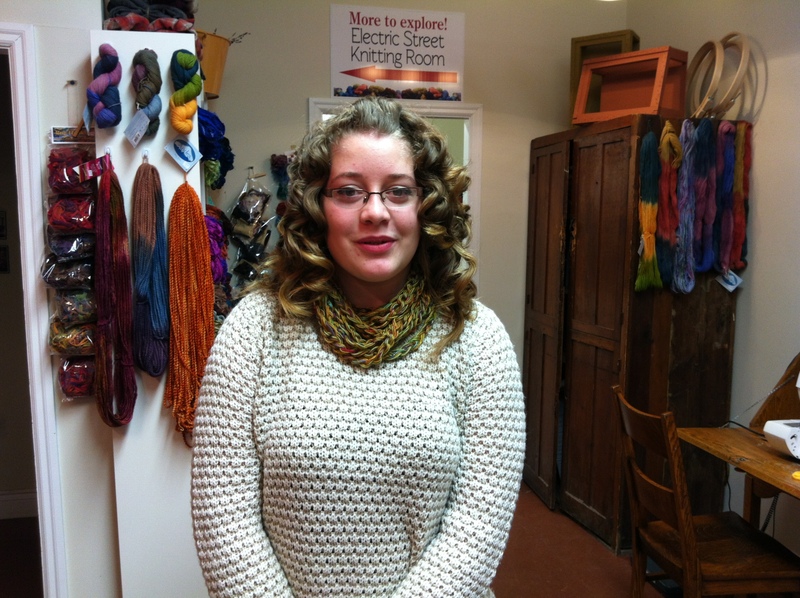 She finished her scarf in a couple of hours and was exciting about making more for Christmas presents. I wrote my little heart out today and something lovely came out of that I think. 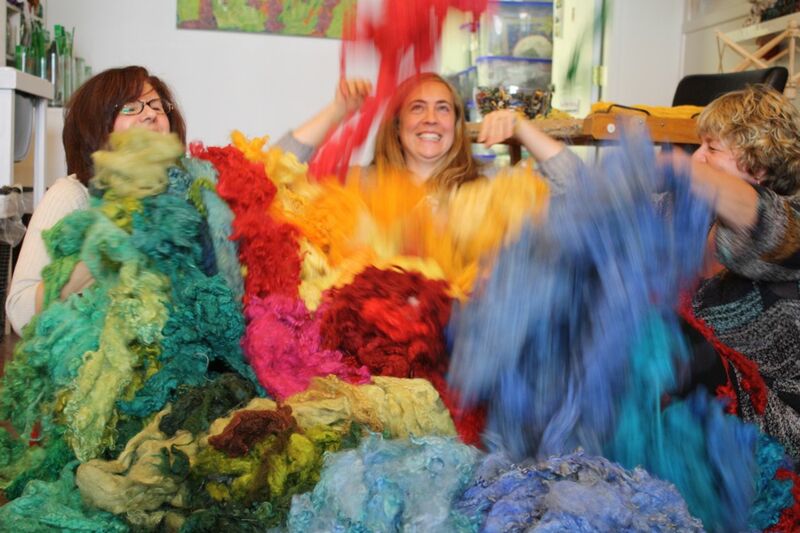 I am preparing gor our big October workshop. Lots done, lots left to do. 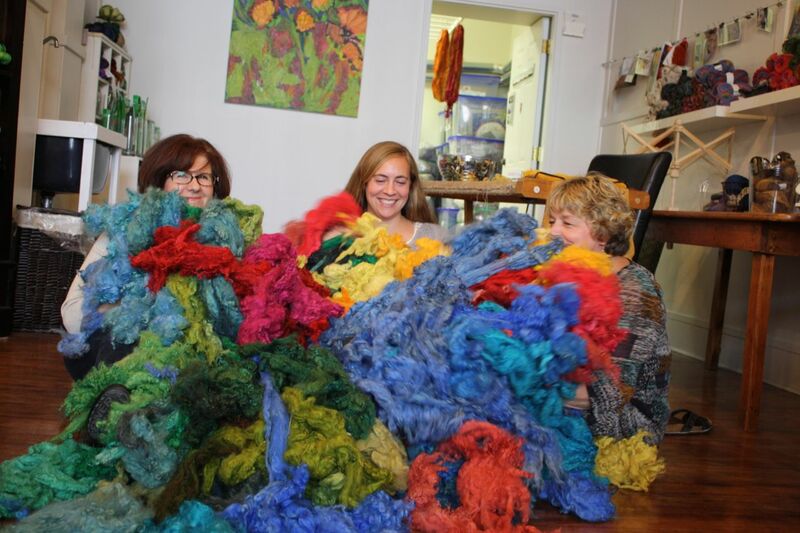 We are also working on the Fibre Arts Festival. It looks very good this year. Lots of great planning gone into it. It was very busy in the studio. Yesterday we had a bus tour from Ontario. We made them a little lunch with help from Fran at the deli. It was very nice to see a big bus parked out ftont. 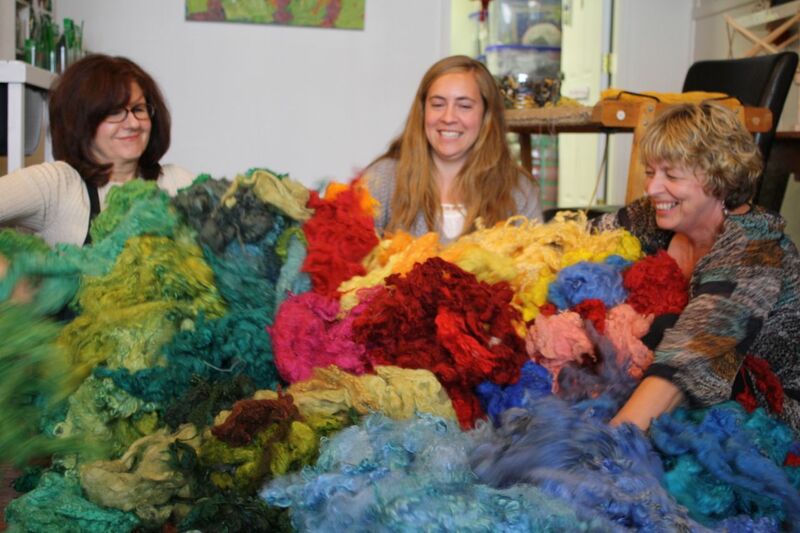 They were all rug hookers and most stayed about an hour and a half in the studio. Lots of tea was poured. The knitting room brings in lots of new people who live in town to the studio. 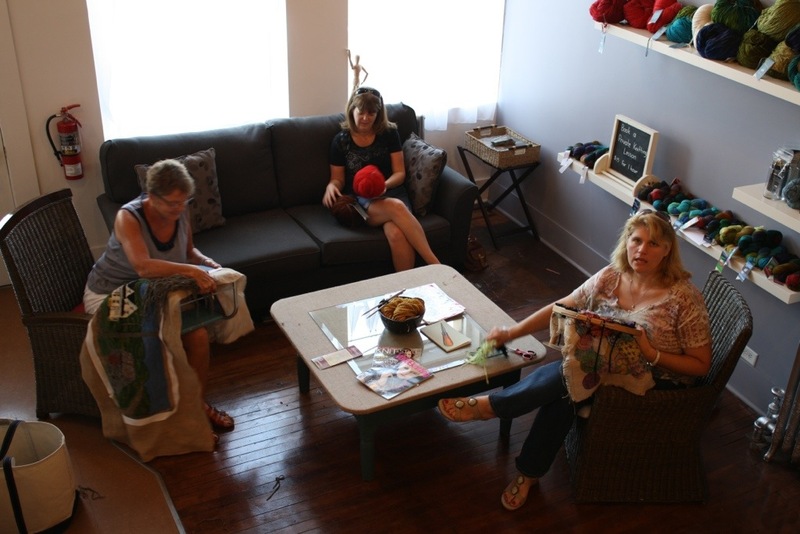 It is really fun to see who is actually knitting. 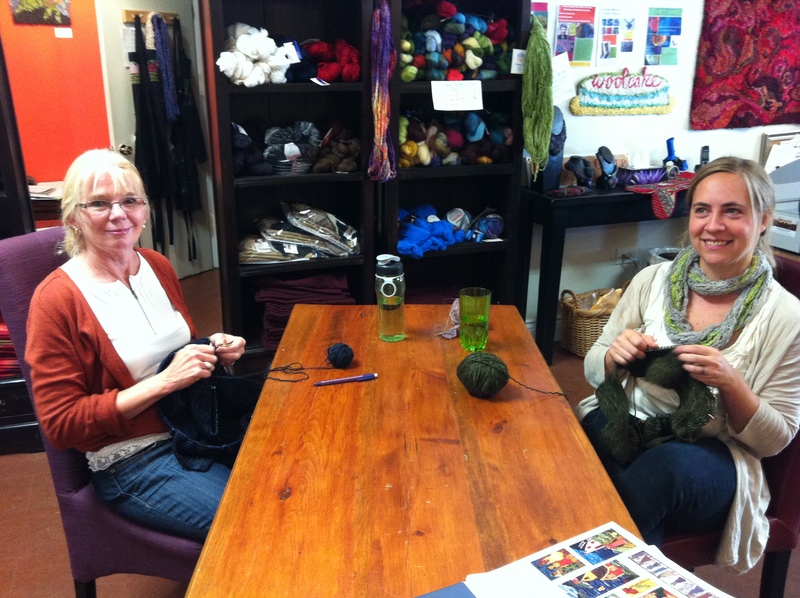 Lots of knitters in Amherst. 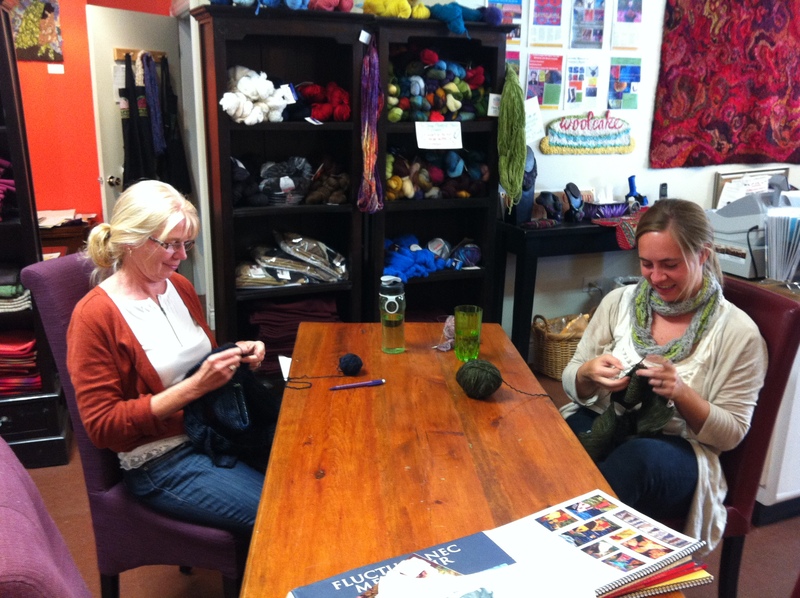 We have started a ten minute knitting or hooking club in the studio. 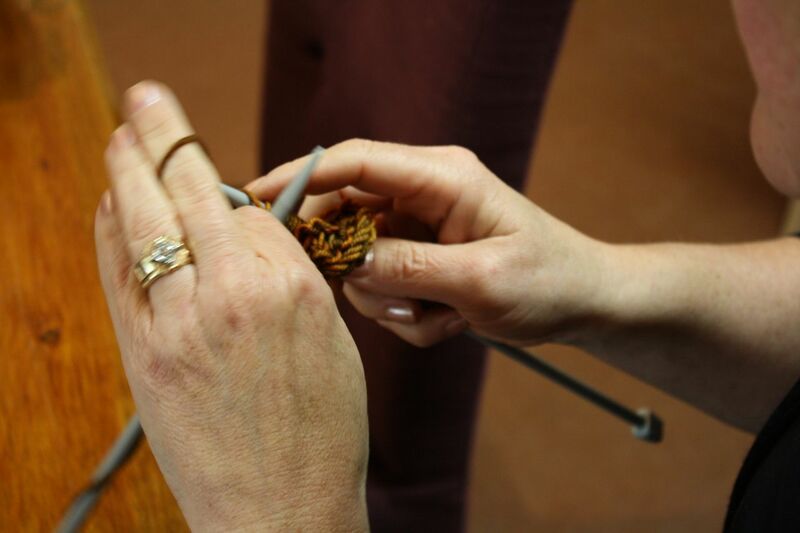 When there is time all of us who eork there will take a break for ten minutes just to do handwork. It is kinda nice to treat ourselves to a few moments. 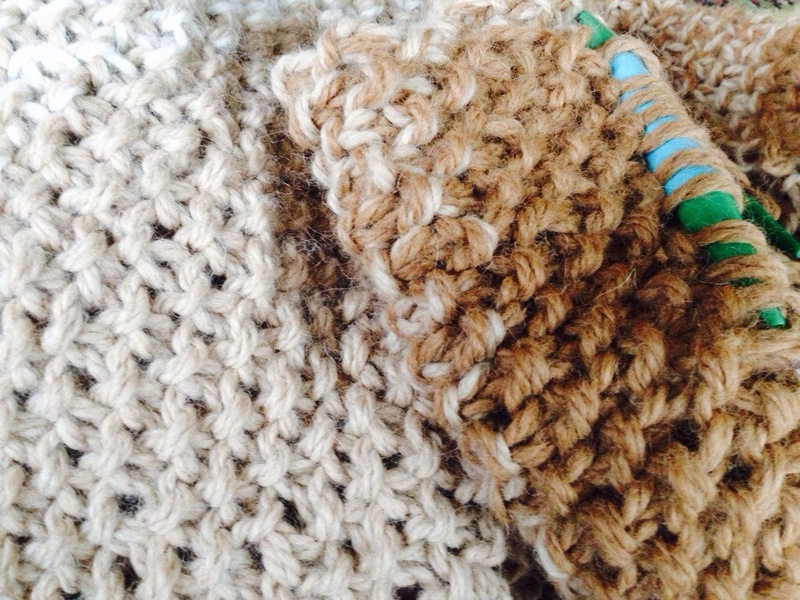 Last night I watched lots of tv and forgot to knit! I was reminded today when I did my ten minutes at work. 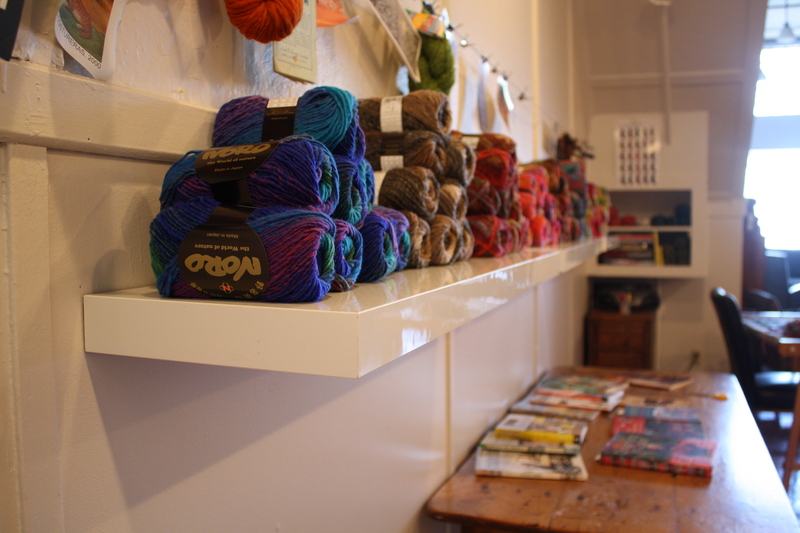 The knitting room looks so full now compared to when I took this picture just a month ago. 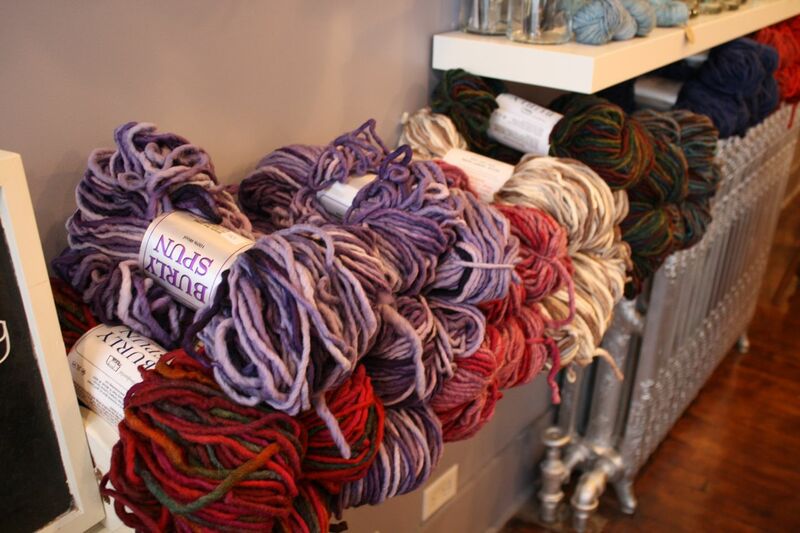 We have it well stocked with great yarns for knitting and hooking. It makes the studio feel so big now that we have all those extra rooms. 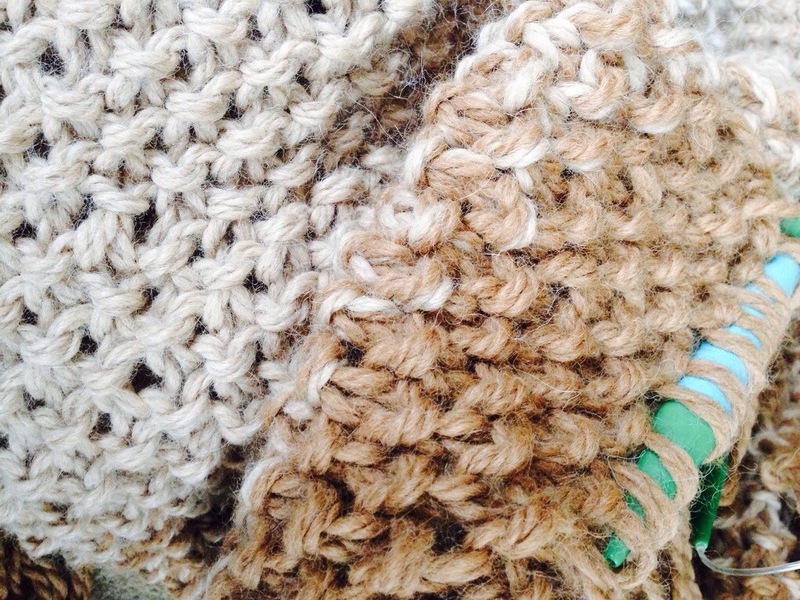 We are getting some great samples knitted up. 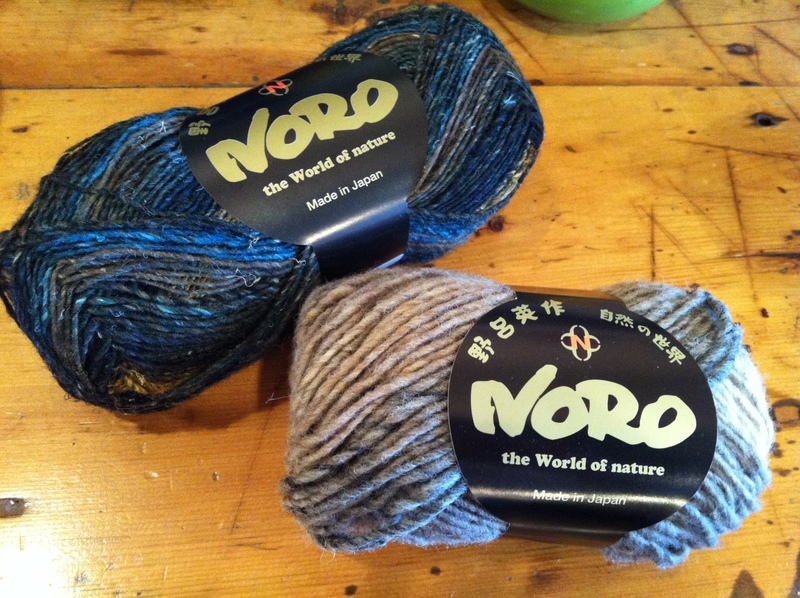 Today we received a lovely pair of knitted fingerless gloves in Noro. 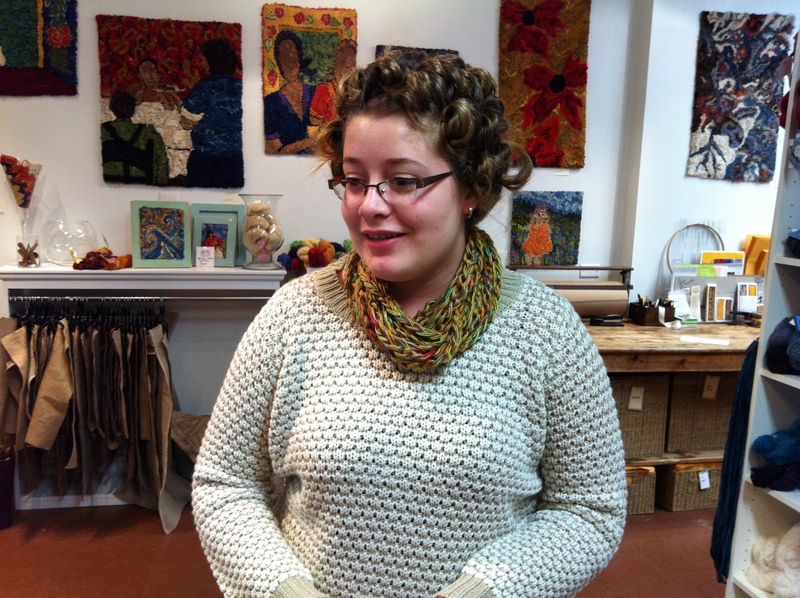 Megan also knit a leaf shawl and we bought a lace Judy to hang it on. 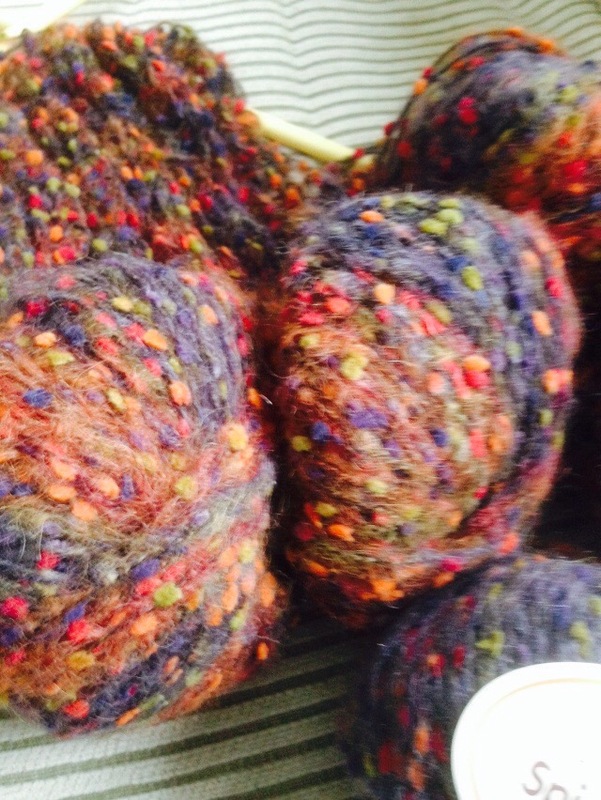 We are busting at the seams with wool and yarn. 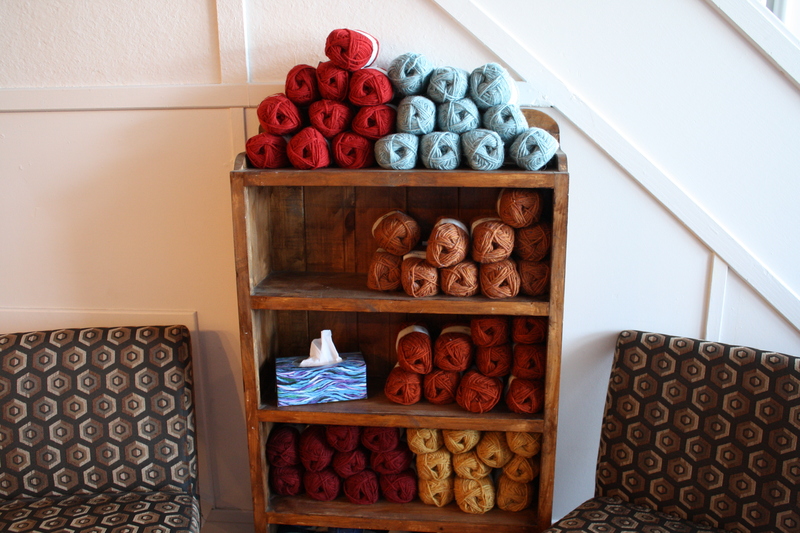 I love all the new wool and came home tonight with a shirt and a skein to make a purse. 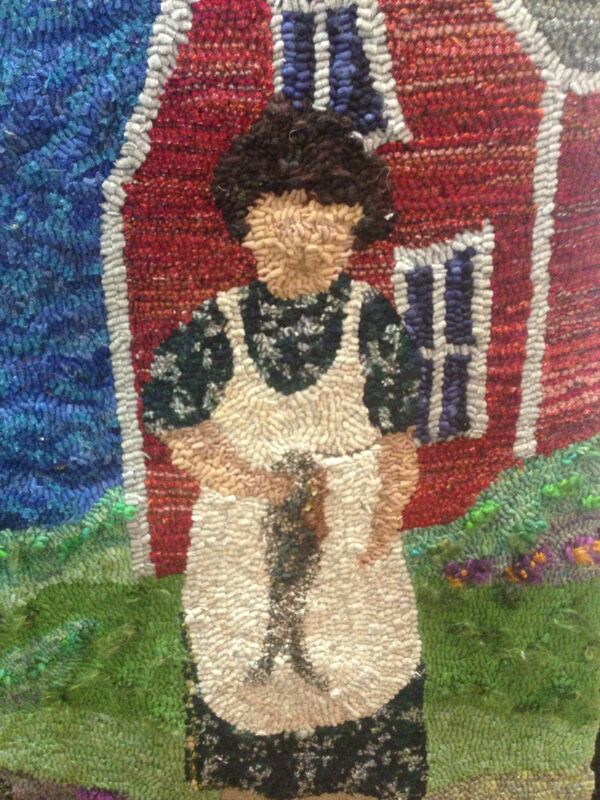 Today we got a new bale of recycled shirts for rug hooking and we washed the first bale and put them out. We had many many visitors today who really enjoyed spending a long time in the studio looking around. In the middle of it all I took a little break and went to the deli for baked besns and gishcakes. She had made a fresh salsa with green tomatoes and apples. I asked for seconds on the salsa and of course Fran generously delivered it. 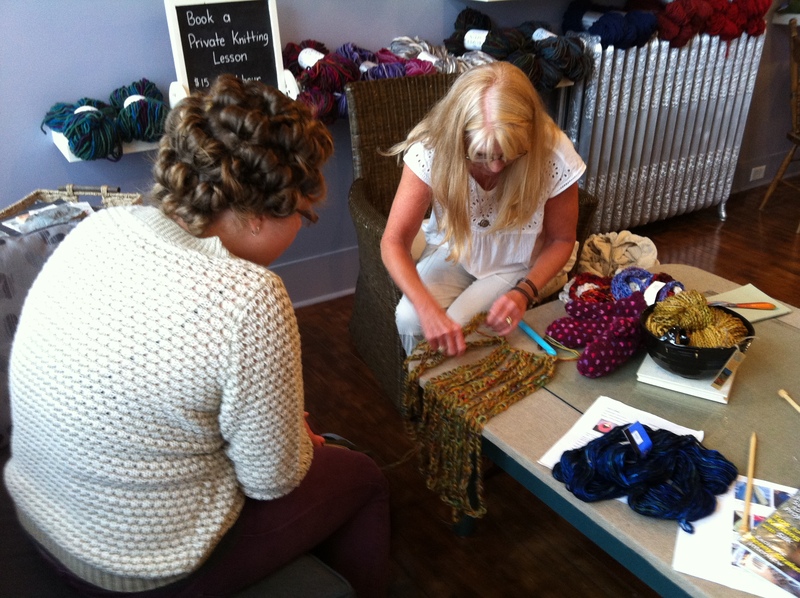 Our friend Vicky has been enjoying Deanne’s new Knitting Shop. 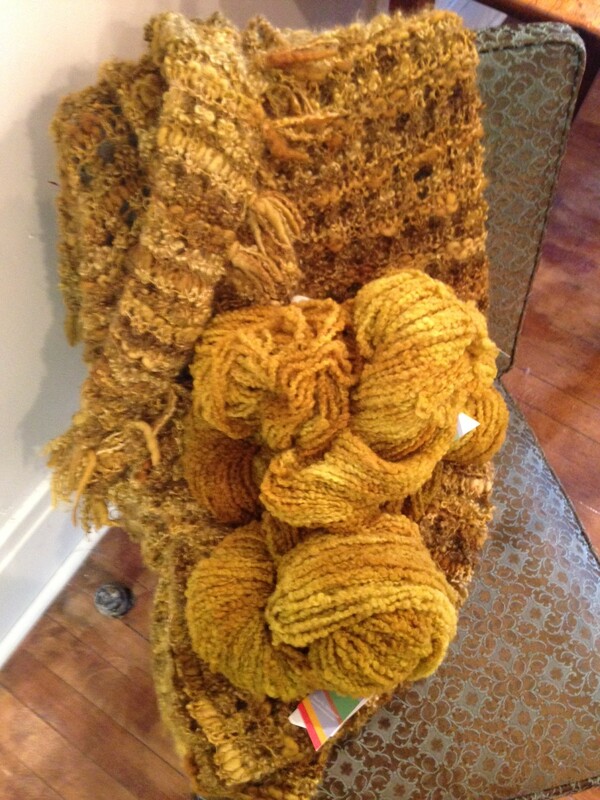 Vicky knits and sells these beautiful purses. 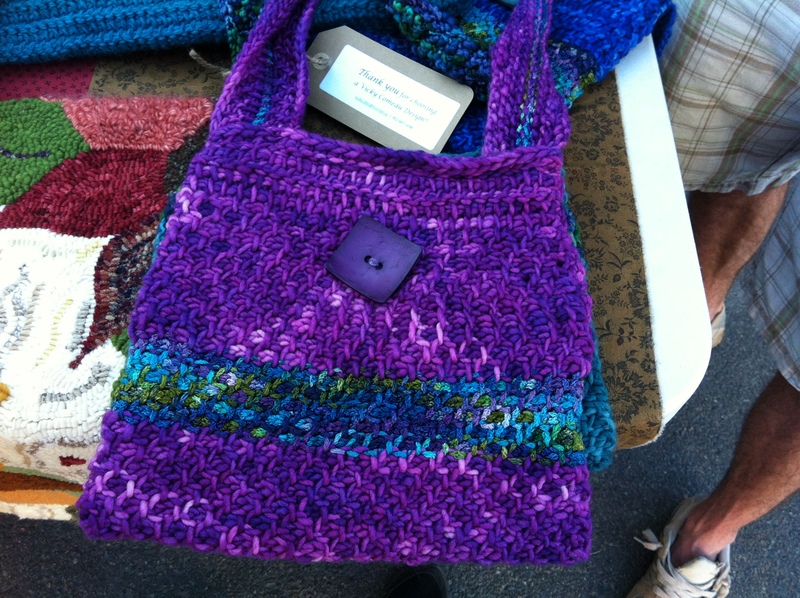 She made this gorgeous purse with the Fleece Artist Chantel Silk yarn. 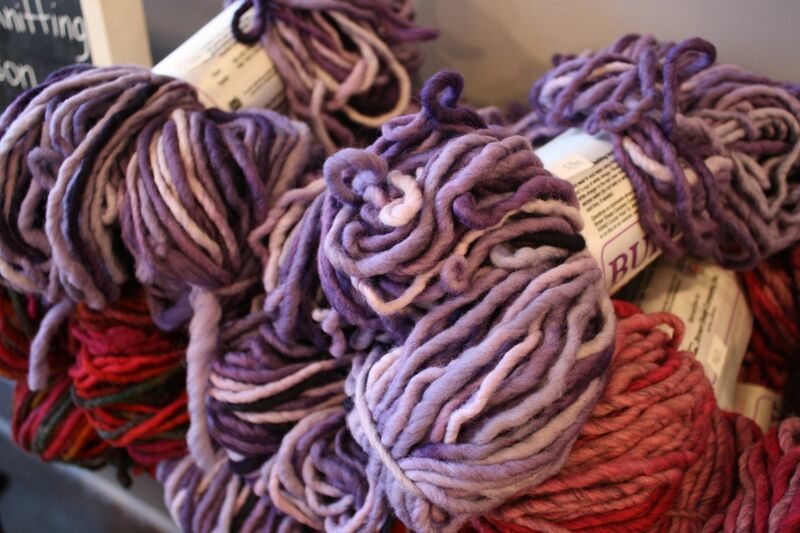 We have some beautiful super wash merino yarns in this week that Megan hand dyed. 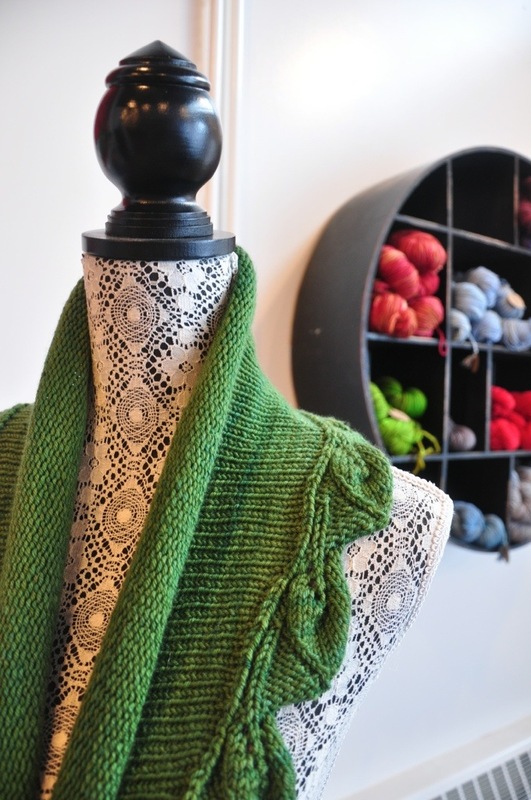 This emerald colorway yarn was the inspiration for the sweet baby sweater that Megan made this week with just one skein. 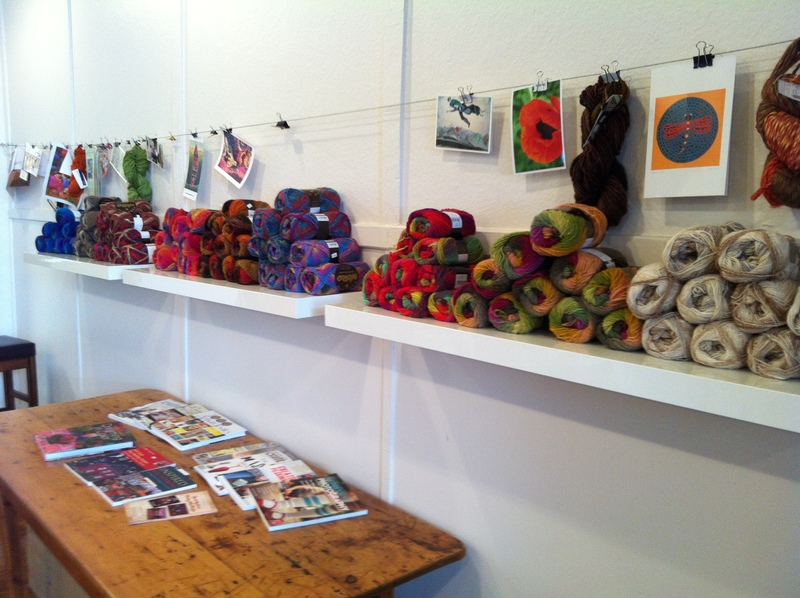 Our Knitting studio is coming together. 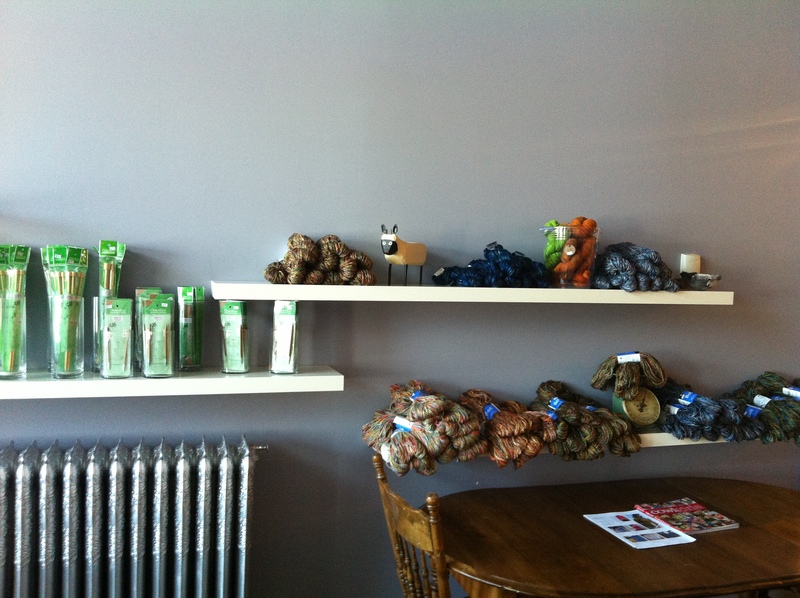 The new shelving has been placed, now just to fill them up. 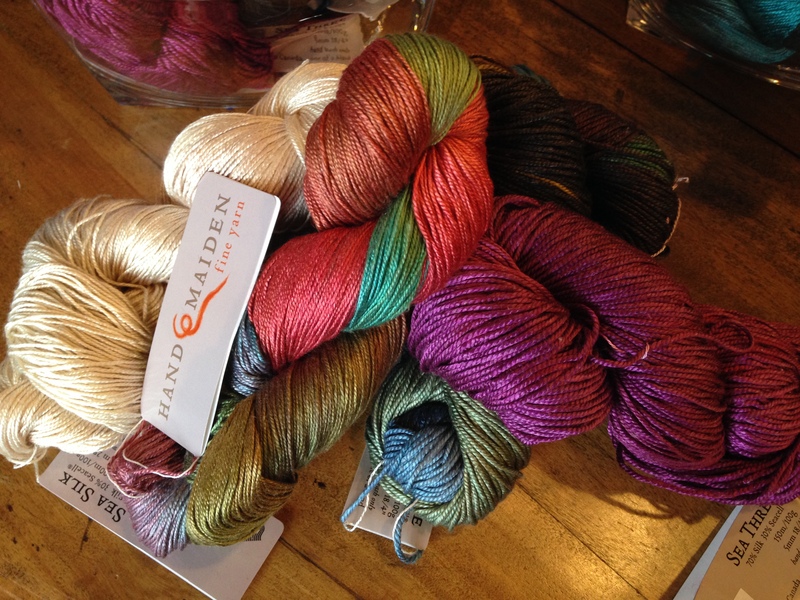 We have beautiful yarns arriving every week. Well let’s be honest. She’s no girl. 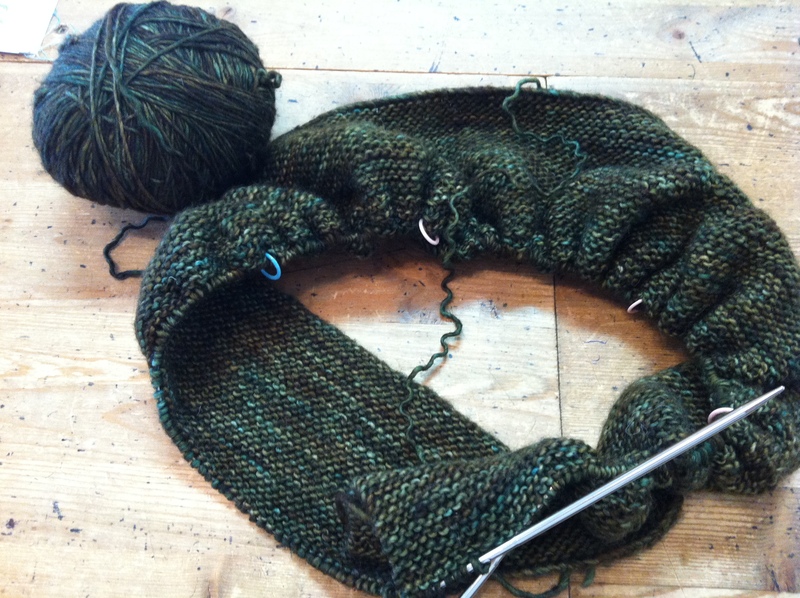 Just as close to granny as she is to girl…still she can knit. She of course, is me. the can’t is no more. I was talking to Mimi the other day at The Loop on Barrington Street in Halifax and she said we create these narratives about ourselves. 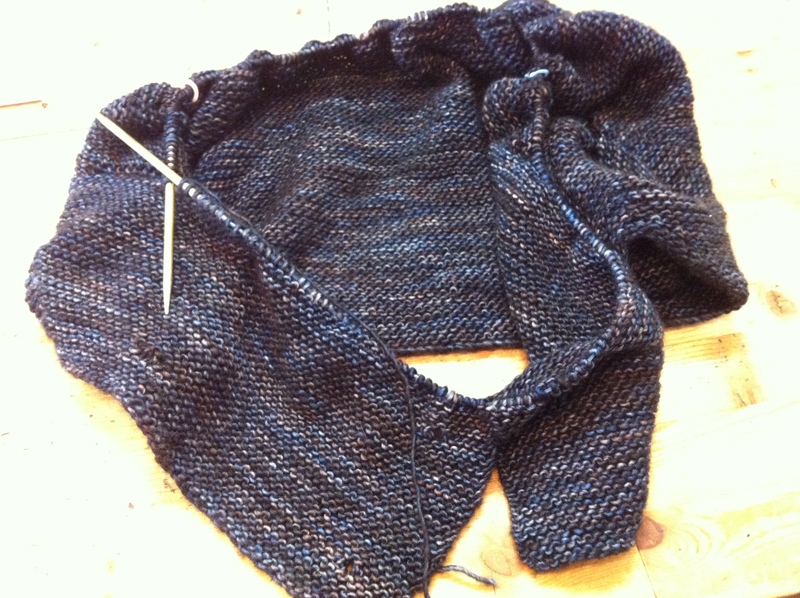 Mine was… I can’t knit. 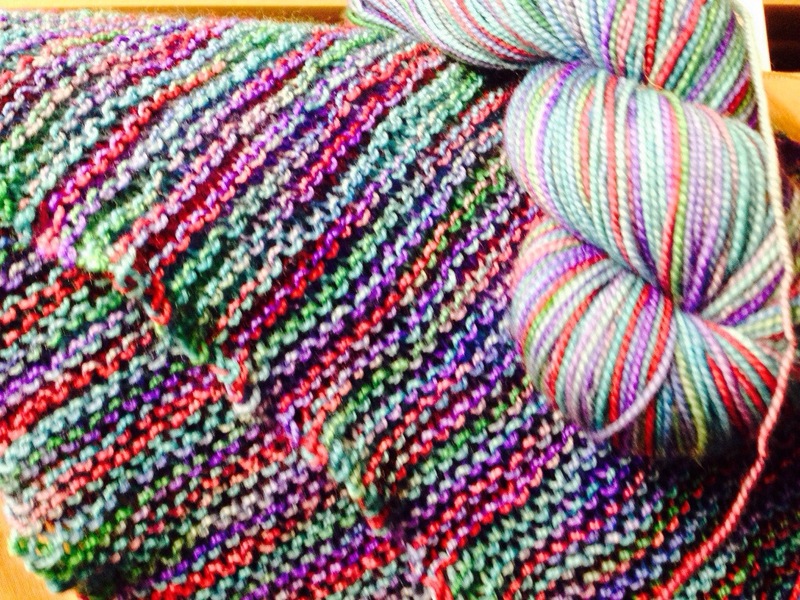 Well I am changing the narrative to …I can knit. I may even be able to follow a pattern. If you tell yourself the same story over and over again you make it real. 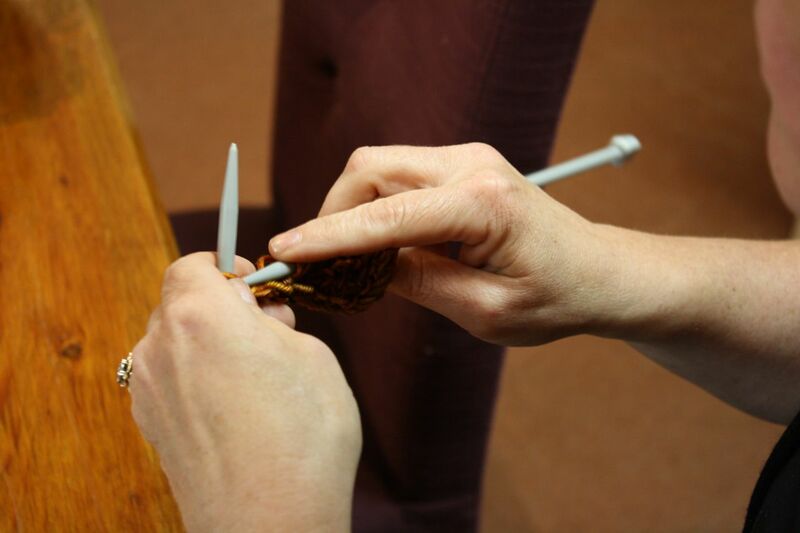 Dear Diary, today a group took me up on my offer to use the back studio and came and knit for the morning. 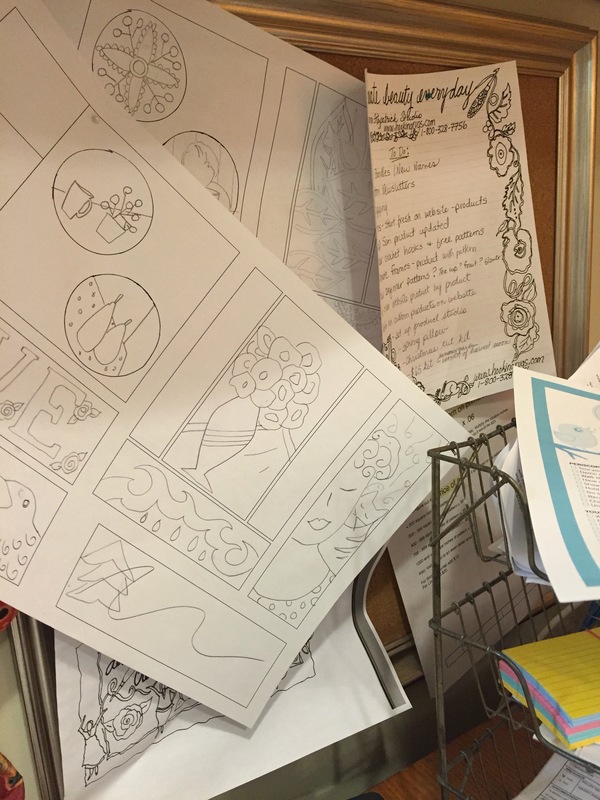 We have a back room , that we use as a workshop room. 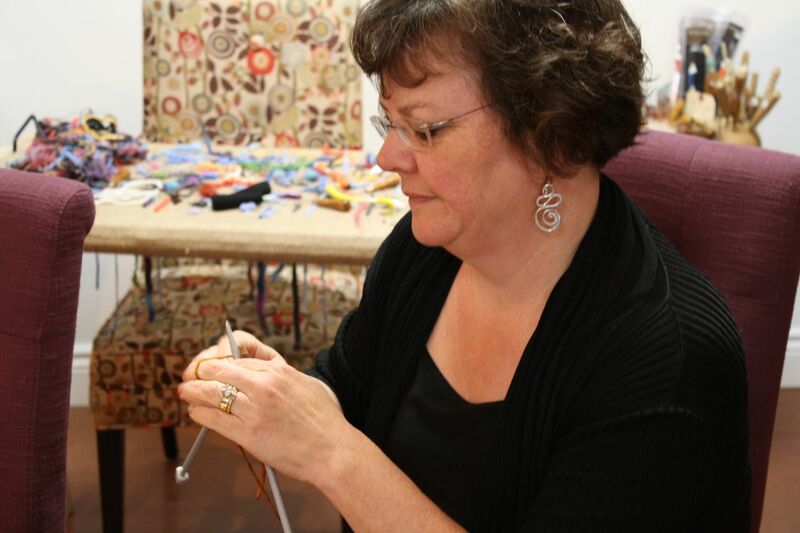 The studio group meets there on Thursdays from ten to two and it is free most other days. Last week , Judith from Pugwash called and asked if they could meet there and I was jappy to say, “Sure “. 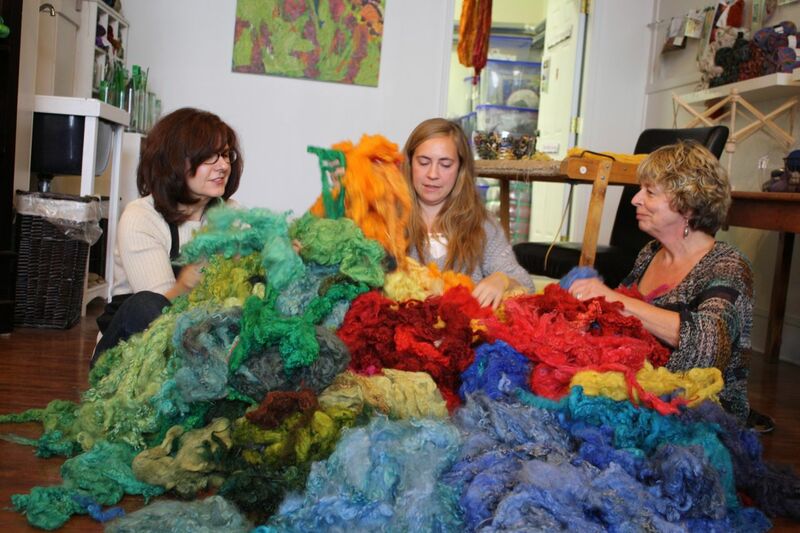 If your group would like to meet for sn afternoon or morning , or the day at my studio you are more than welcome. 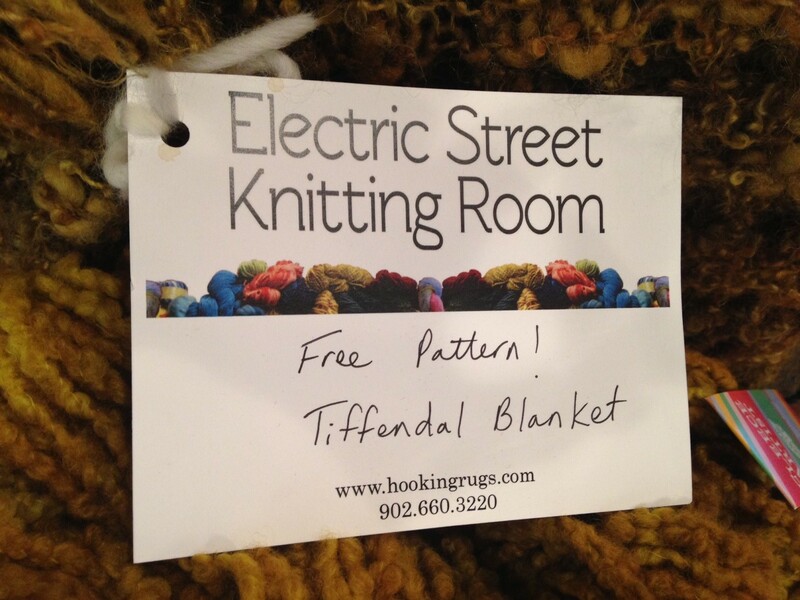 There is no charge because we know you’ll shop at the studio. 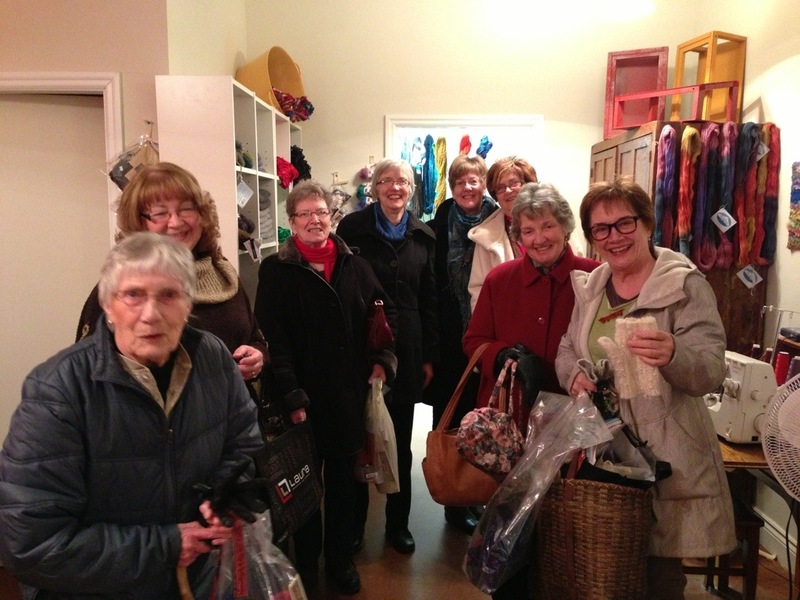 The Pugwash knitters did. 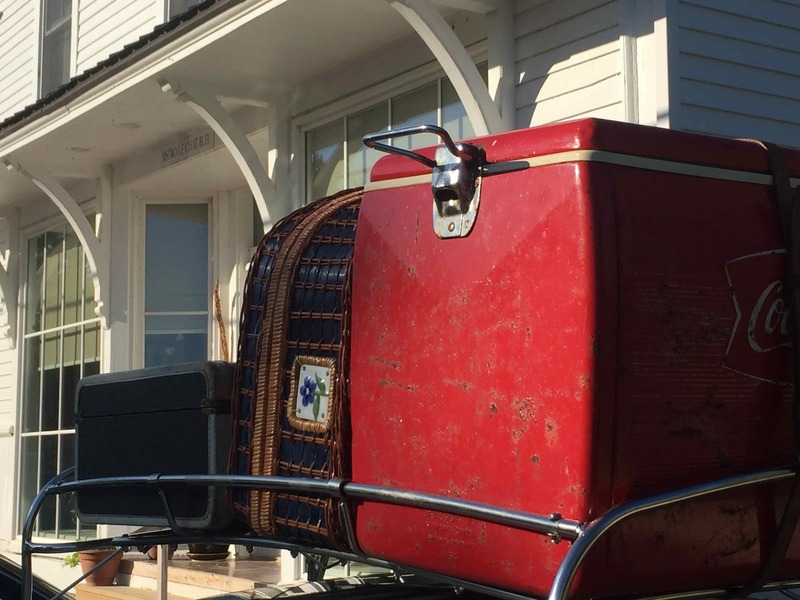 We appreciate that it is nice to get away. The space is comfortable and has great lighting . so call us and book your group in. We’ll make the coffee and tea and you can have it in our pottery mugs snd we’ll even do the dishes. We want to see the room being used, people visiting and shopping in the studio and in downtown Amherst. You are most welcome. Come and bring the gang.